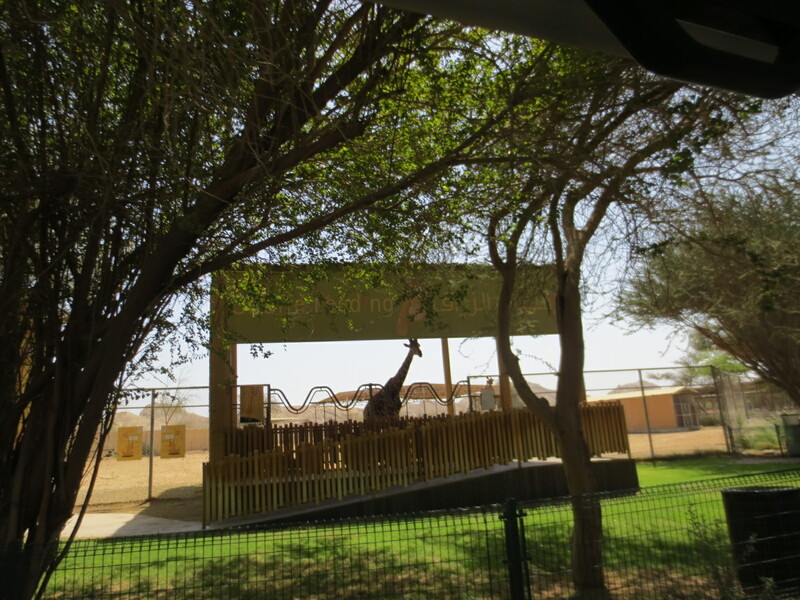 Al Ain Zoo – I fed a giraffe! OK, so…. 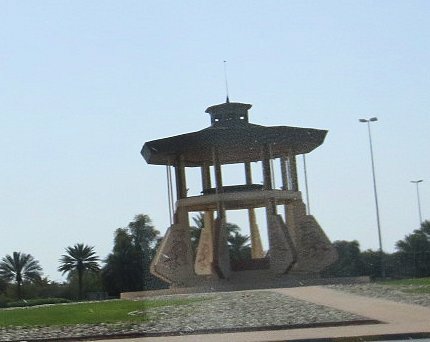 this is the part I’m excited about, and you’ll read about in a bit…..
Al Ain is another town about two hours’ drive from Dubai, it’s a much smaller town, and from everyone’s description of it, I imagined it to be a sort of Podunk kind of place small, not much to it, you know? Boy, was I wrong AGAIN. 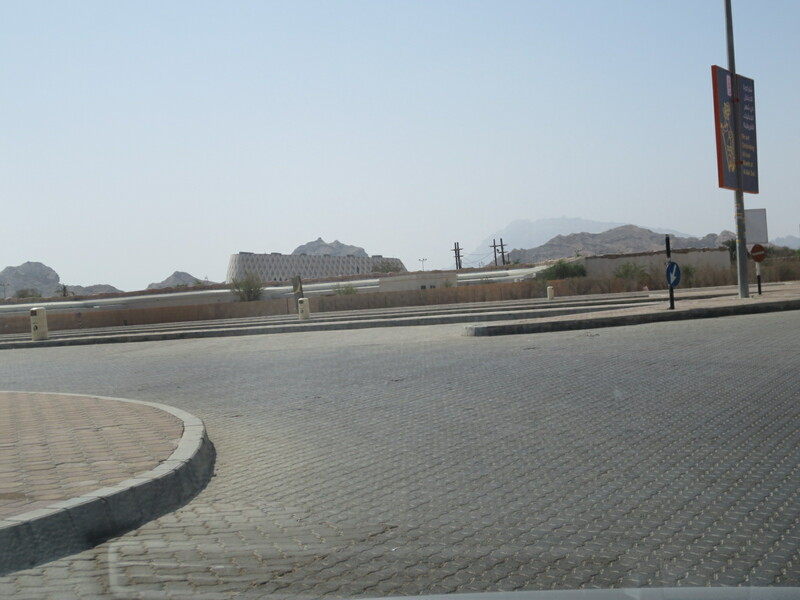 It sits on the border of Oman, and is built around seven oasis areas. 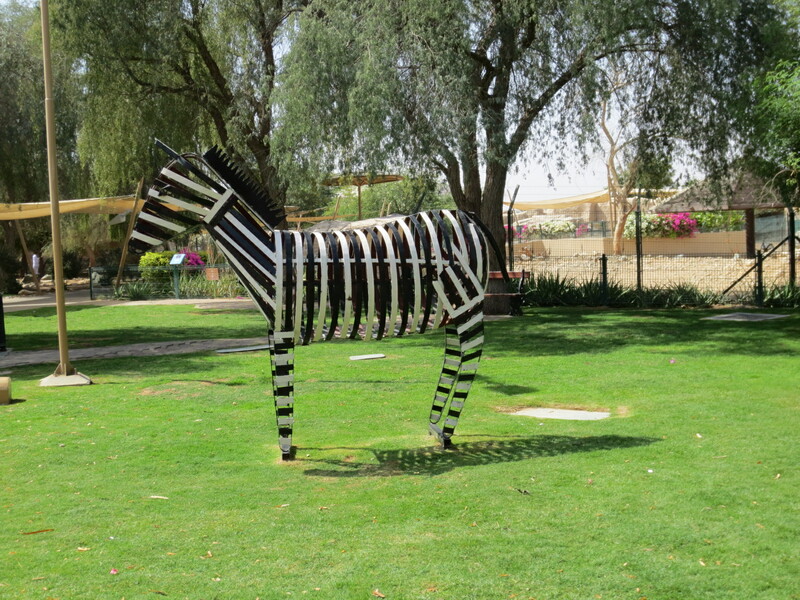 It’s referred to as the Garden City or Oasis of the Emirates and is a very fertile area, we saw tons of small family gardens all along the way. 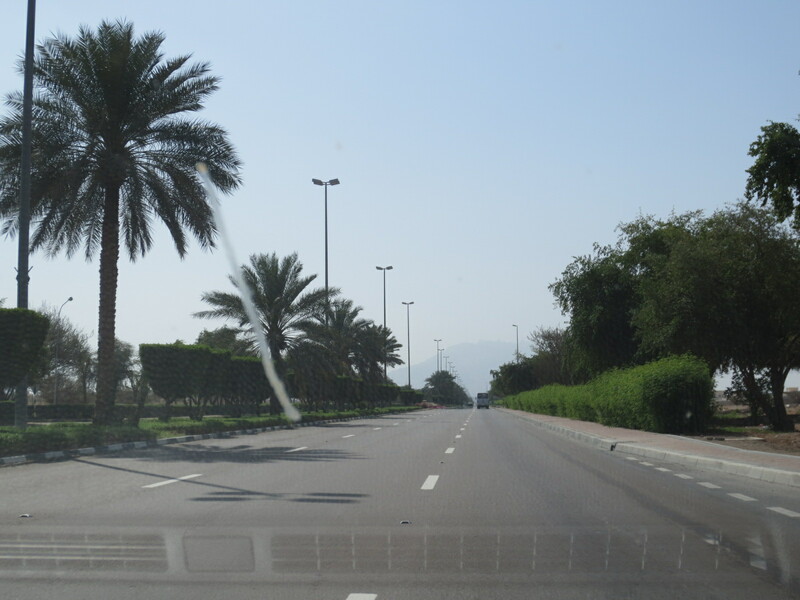 The drive there was as uneventful as any drive in the UAE is – you just learn to roll with the lunacy and keep your insurance paid. 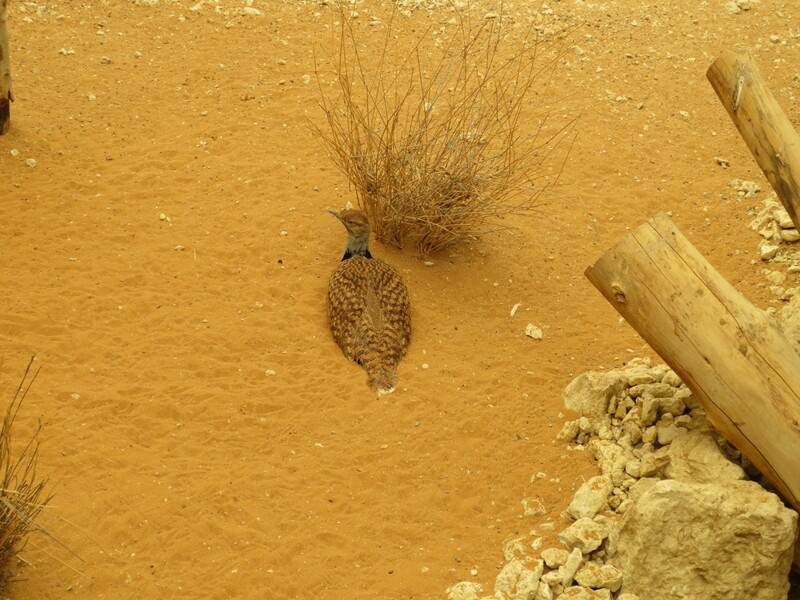 I did get to see the difference in the sand in the various desert areas, though. 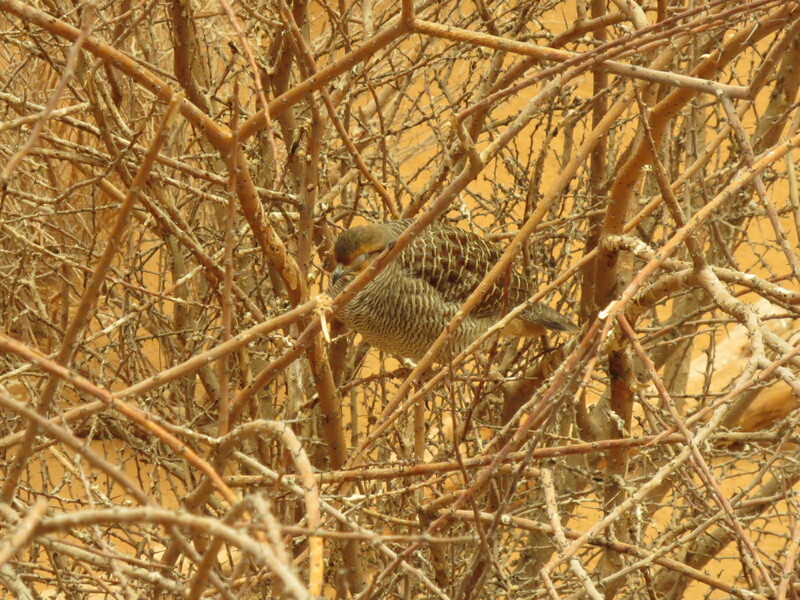 Here around Dubai it seems mostly white-ish sands, and khaki colors. 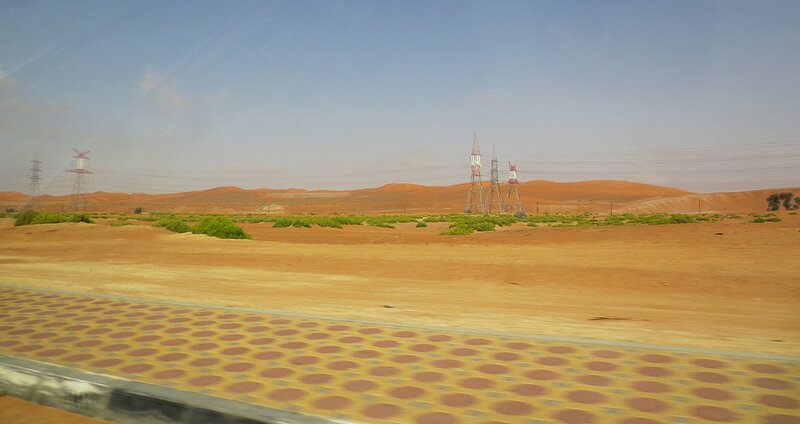 But further into the desert, it turns red because of the iron oxide content – kind of like Alabama red clay. Interesting. 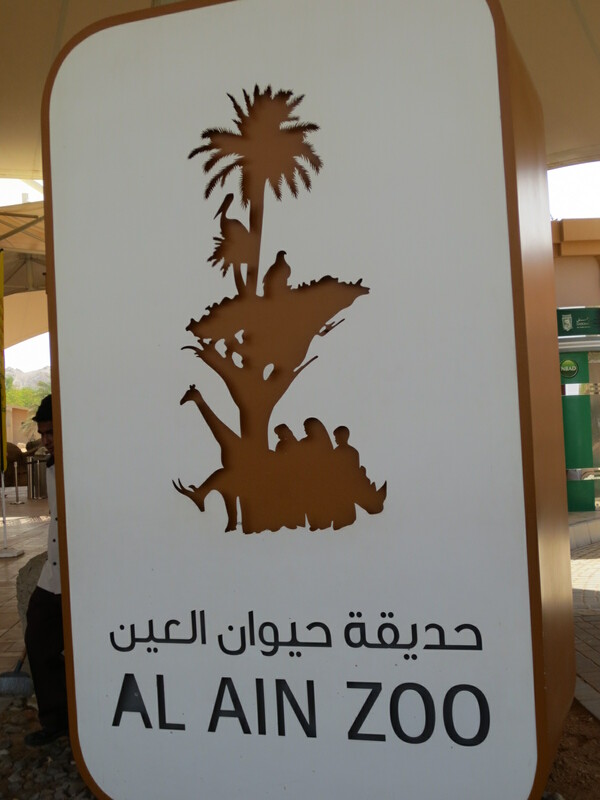 Filled with incredibly ornate villas/mansions, the drive to the zoo had my head swiveling around like an owl’s. 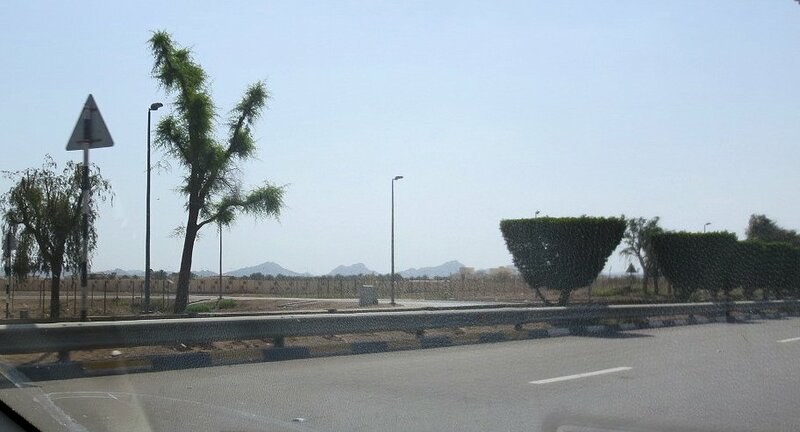 I looked ahead through the haze and said to TBG “So, honey, does Al Ain have mountains, or are those clouds ahead or what?” He hesitated a second, looked at me funny and said “Mountains.” And after a bit of googling, they’re the Al Hijr al Gharbi mountains to be exact. 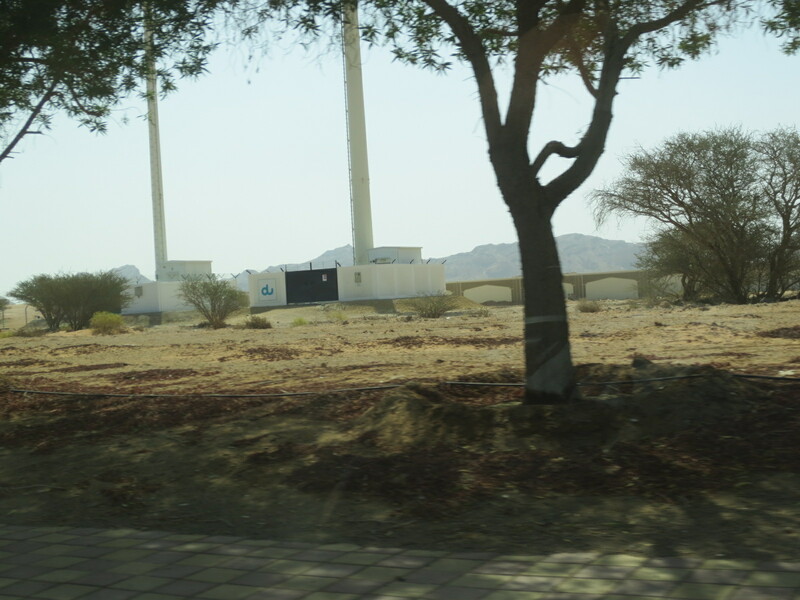 But the one we were seeing is called Jebel Hafeet and it is the tallest mountain in the UAE at 1340 meters high. 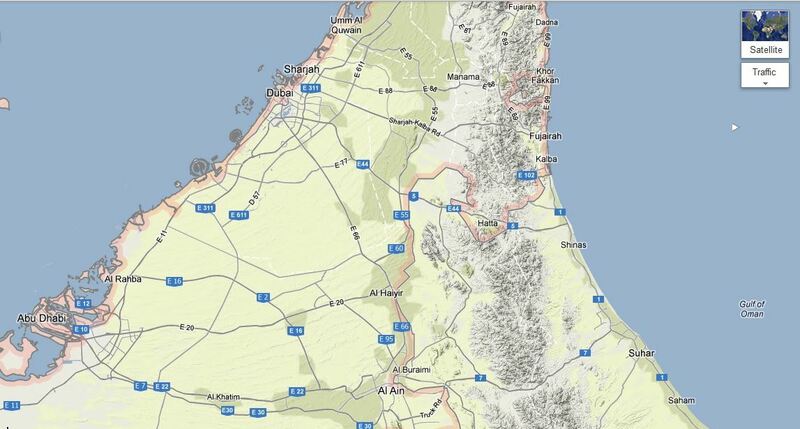 It straddles the Al Ain city and Oman borders. 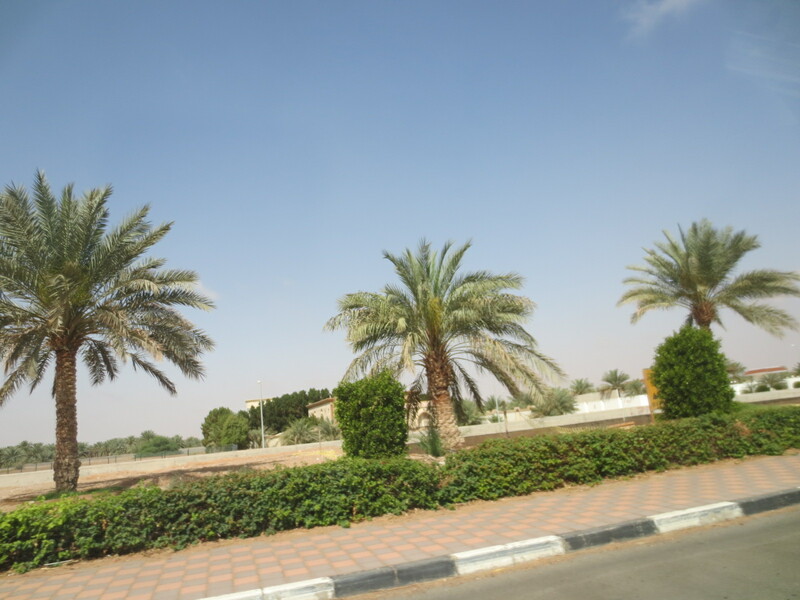 Here’s photos taken on our drive in through a desert area I’d not seen yet as well as some of the homes, and scenery. 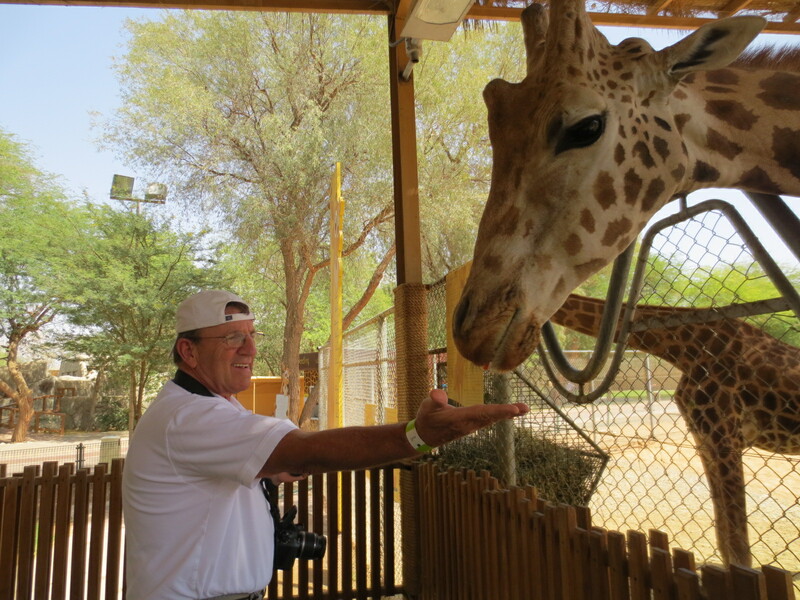 I had asked some of my “imaginary friends” on a local website about any tips they may have for me during my first trip to this zoo…. They all said “go early, wear comfy shoes, sunscreen and take a picnic lunch”. They were exactly right, except for one tiny detail….. a big sun hat! TBG reminded me just as we were walking out the door, and I’m grateful he reminded me of that – it was a lifesaver! 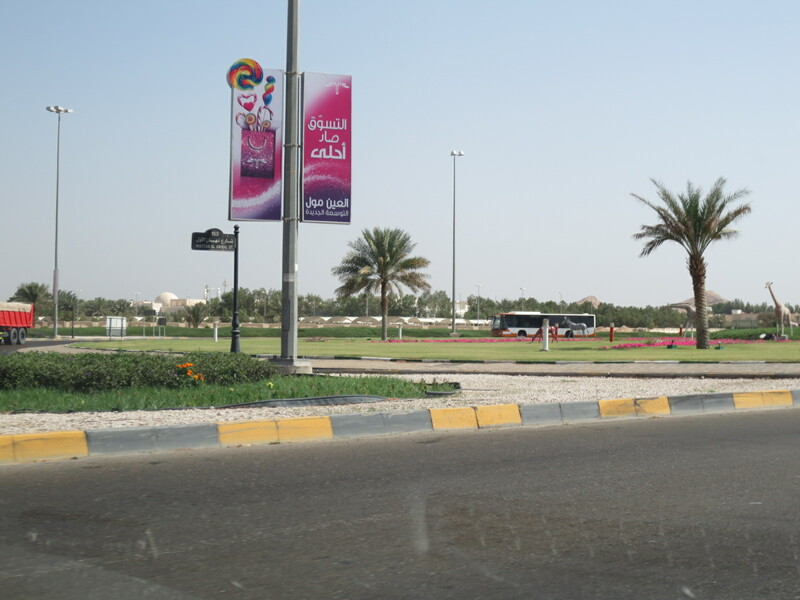 This is the entrance sign, and area right inside the “gate”…. You go to a window on either side, pay for your tickets, and go to the turnstiles. Of course, you can’t possibly scan your *own* ticket, so there’s a guy there to scan it for you and then hand it back. ?? 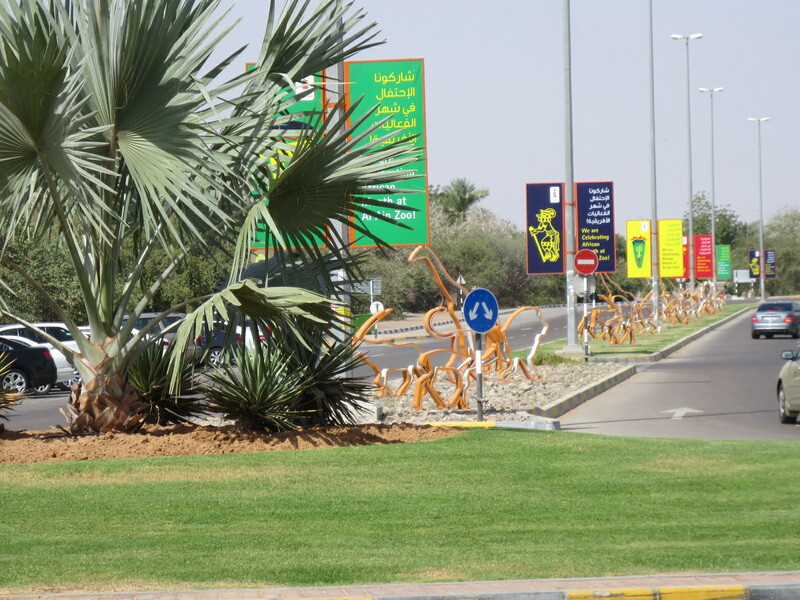 Anyway, it’s only about AED15 each to get in, a big bargain, for sure. 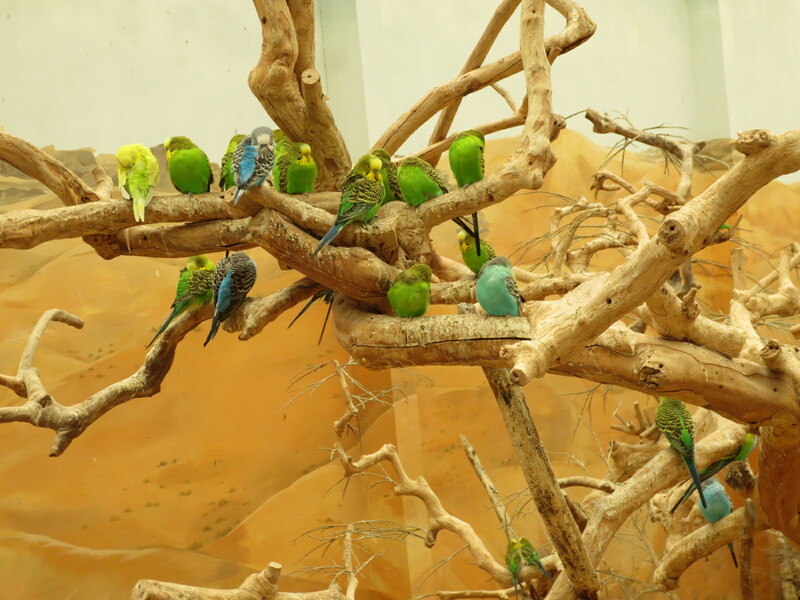 Look at these guys…. they’re learning to fight to get the girls! 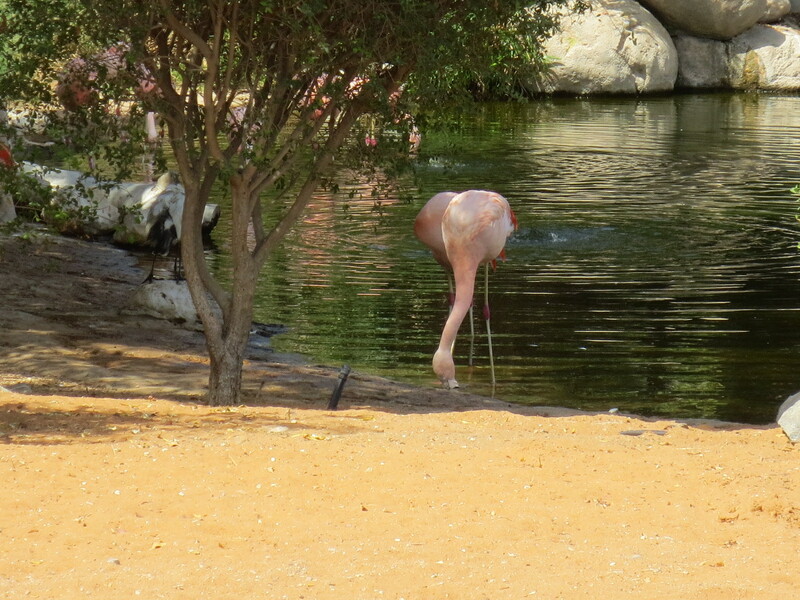 Pink Flamingoes – they look kinda peachy-colored here, but in the shade??? 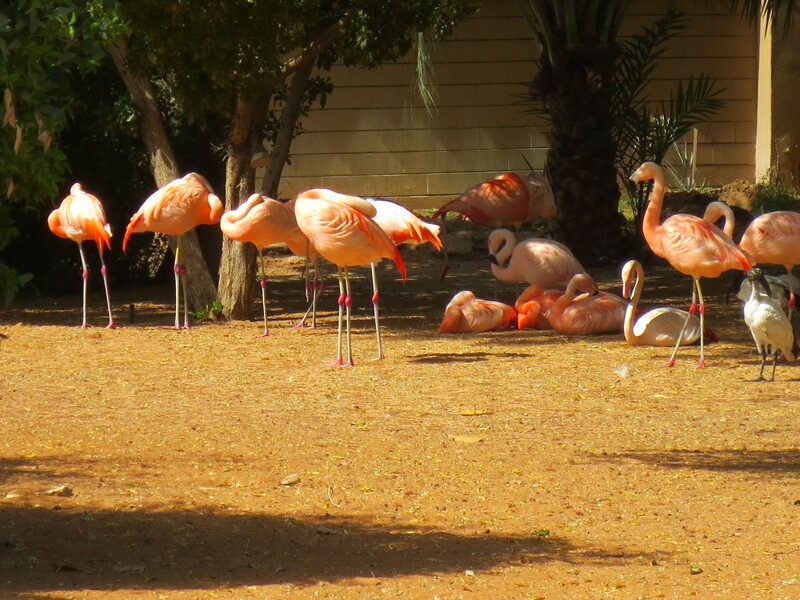 In the shade they’re pink as can be! 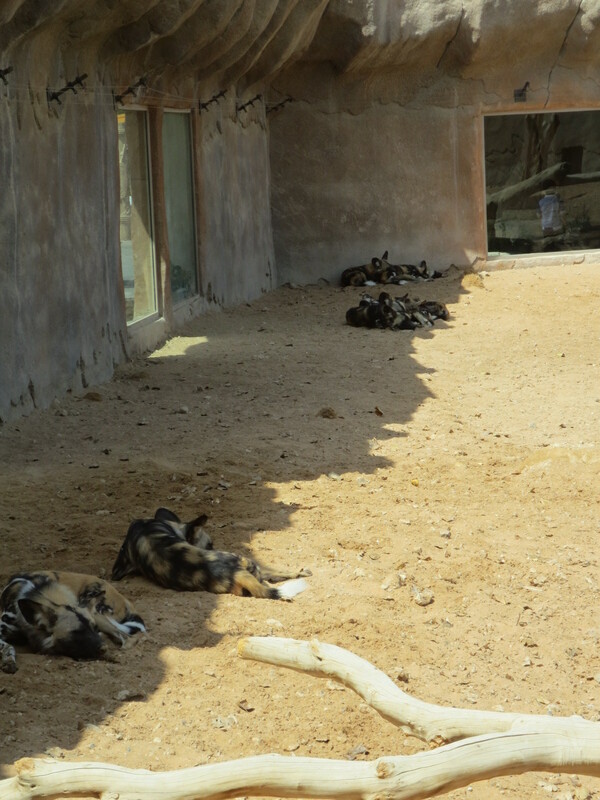 Desert Dogs. 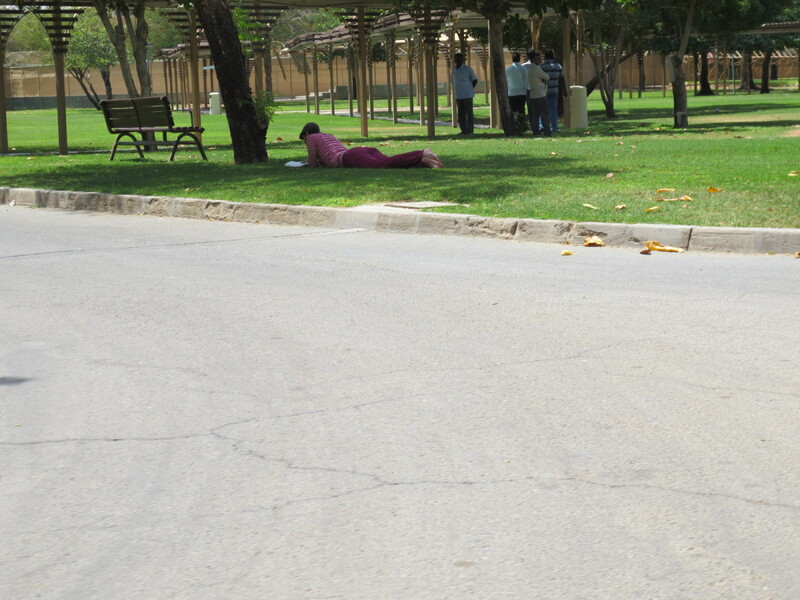 Doing what all dogs do in the heat of the day…. they sleep. 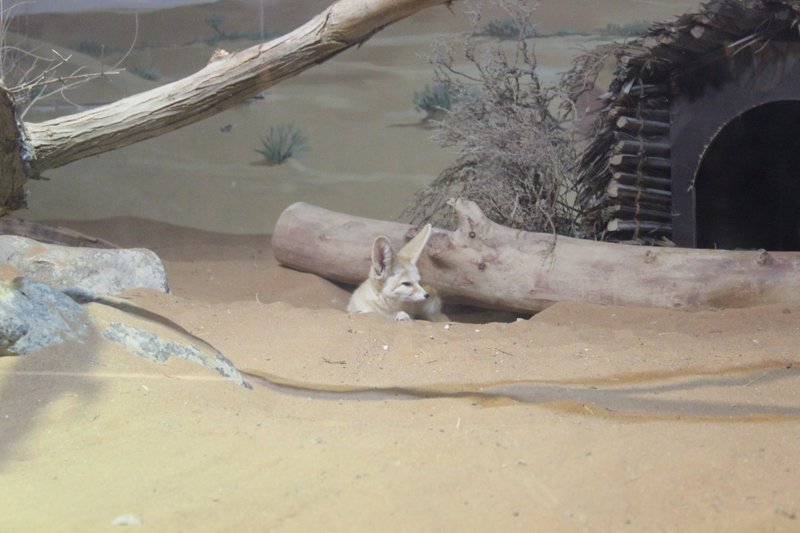 Now, aren’t these just the cutest critters? 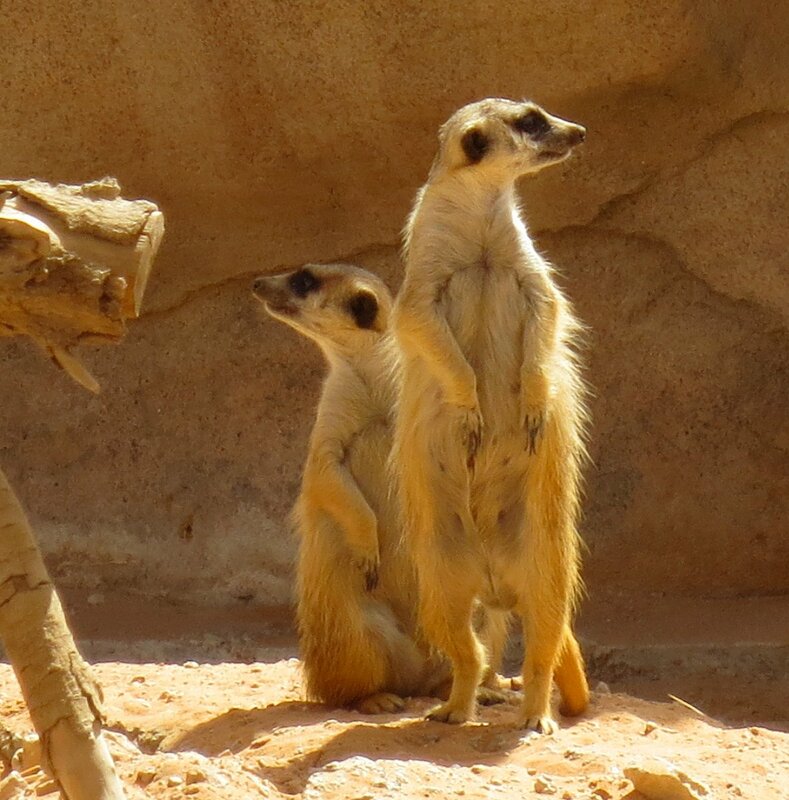 Meerkats! 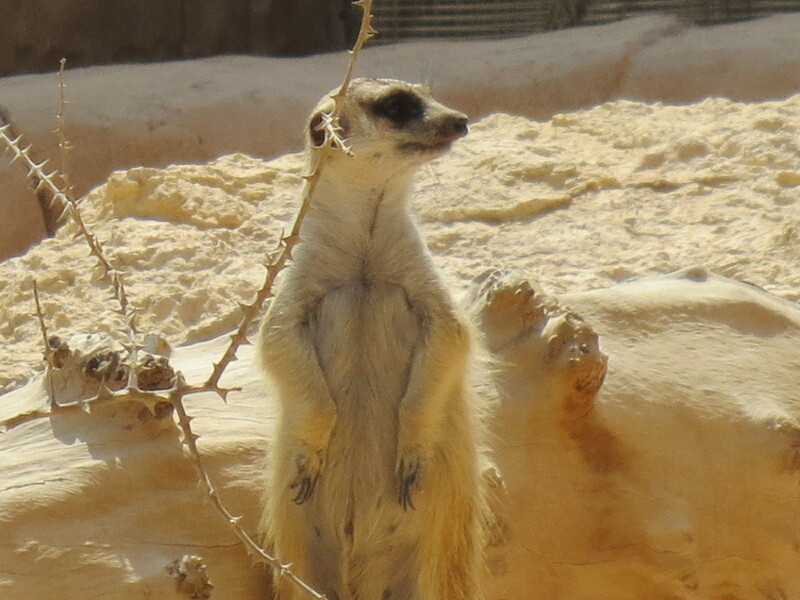 They remind me of prairie dogs…. but smaller. 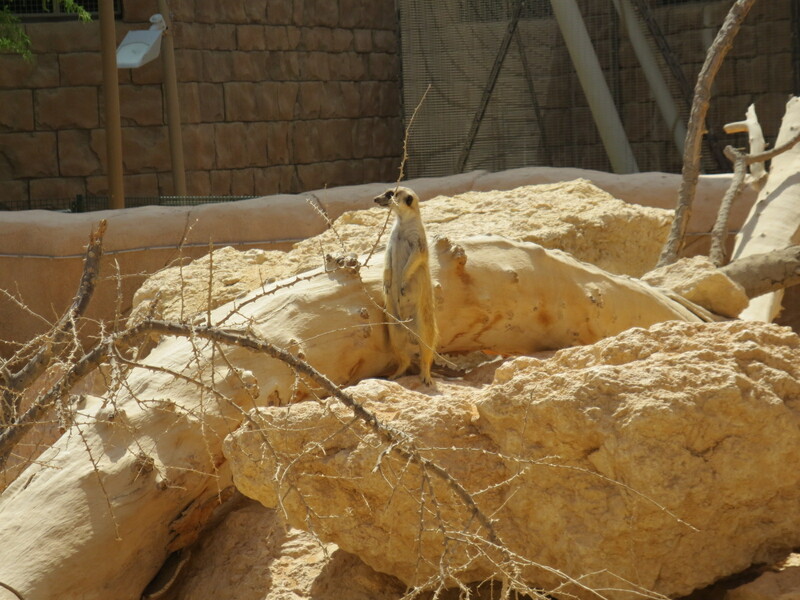 Meerkats are very social critters… they love being around other meerkats! 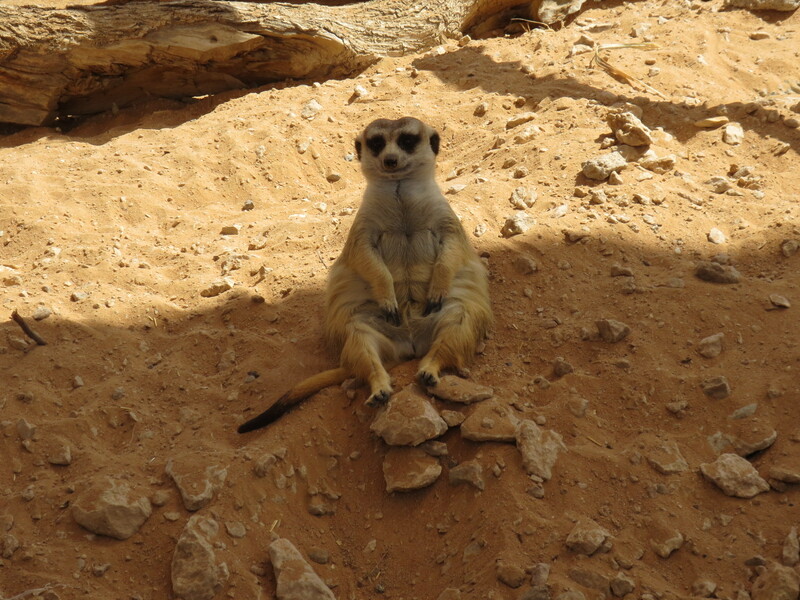 And this guy just flat-out sat down and posed for me….. waited for me to take his photo! 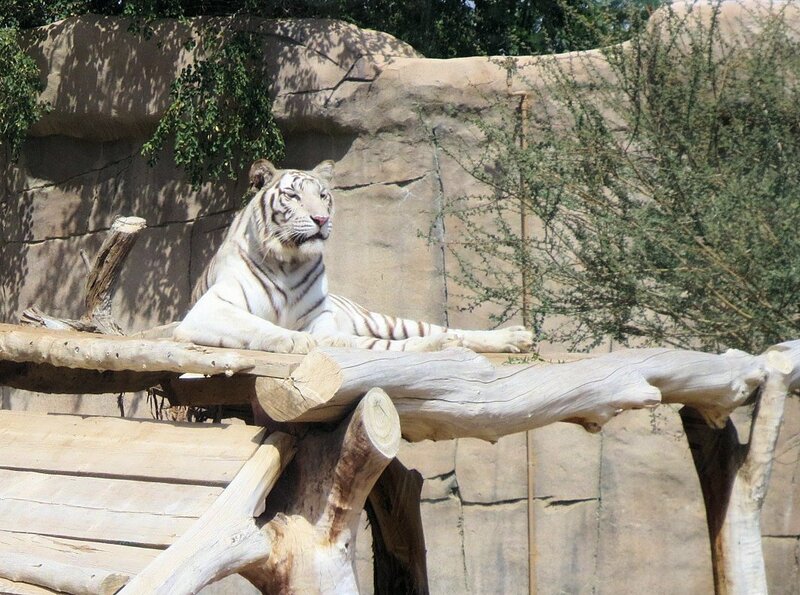 This is where the White Tiger lives! Hey! He was awake! Awesome looking critter, isn’t he?? 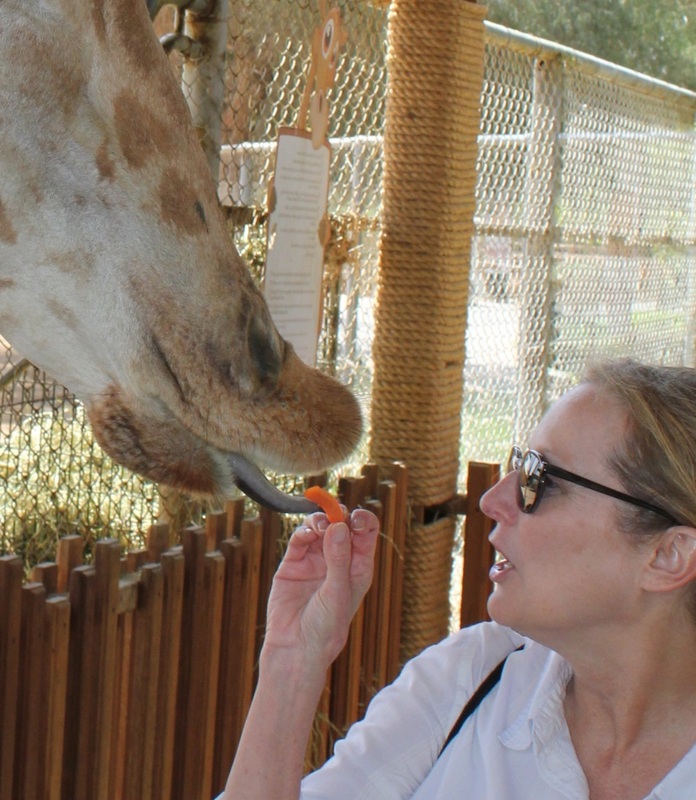 But, by far, my favorite part of this excursion was definitely getting to feed the giraffes! 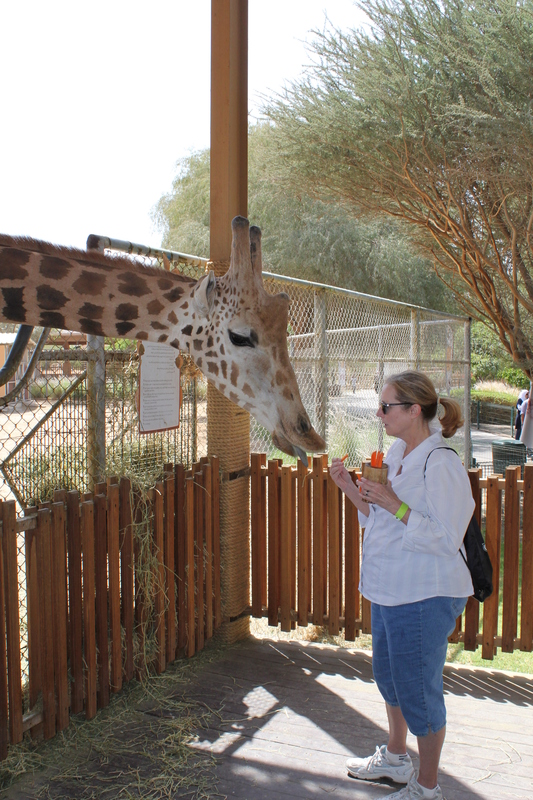 There’s a fairly mundane-looking sign that says “giraffe feeding station” and I made a beeline for it…. 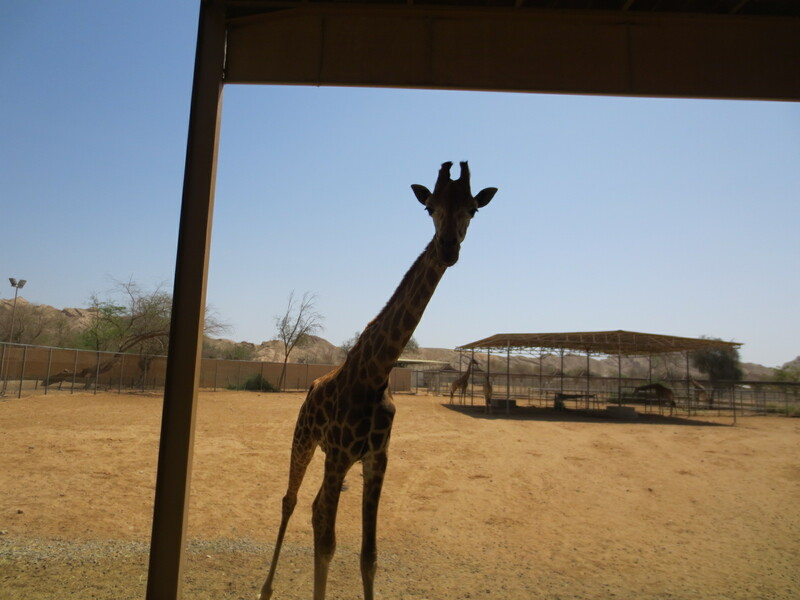 Walked up the ramp to the GIRAFFES! 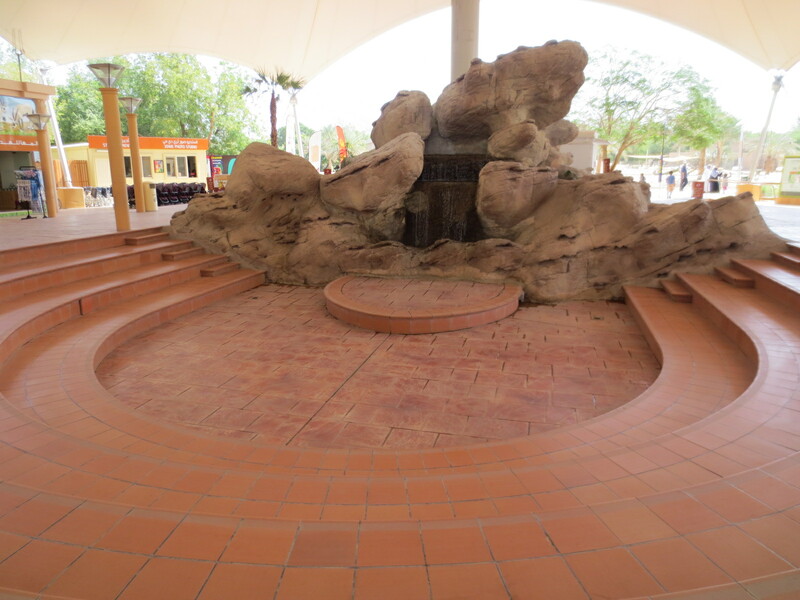 Well, after I stopped at the lady’s kiosk and paid my AED30 for a cup of carrots to feed them… and washed my hands…. Listen, till you’ve seen one of these suckers heads coming towards you quickly because they know you have their favorite snack, you don’t really understand how BIG they are! I had no clue that their heads were almost half the size of my whole body. Huge. Really big. 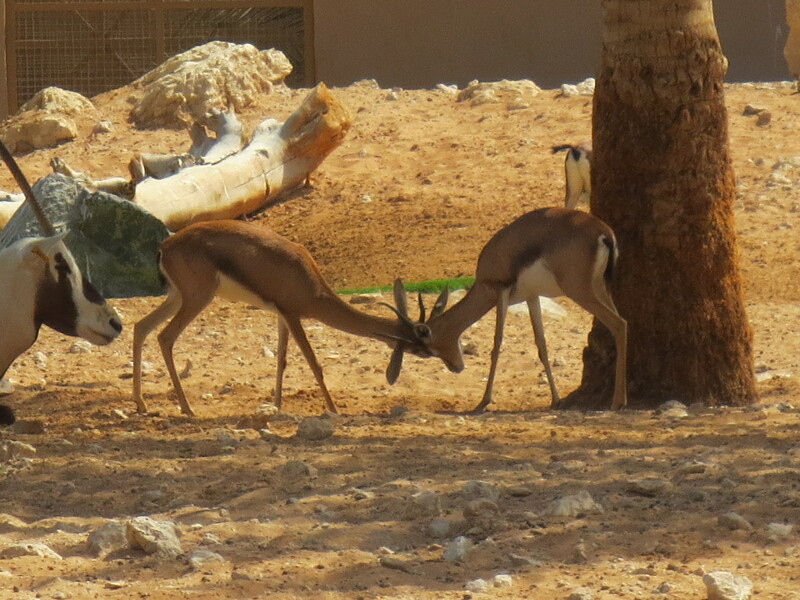 With horns, and eyelashes, and a muzzle that feels like a horse’s – all furry and with long prickly whiskers on it. 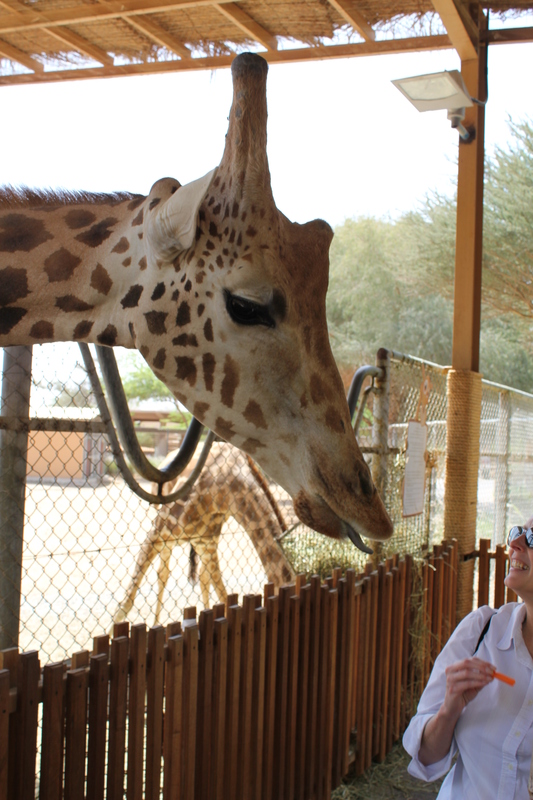 And apparently ticklish, because they would always jerk their heads away when I tried to pet their noses. Oh my gosh… there’s one! 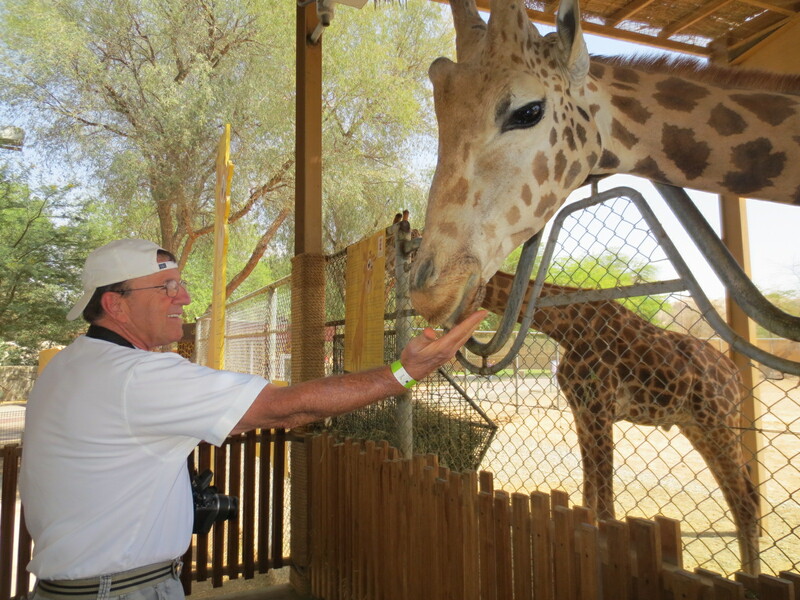 It’s TBG, and he’s gonna feed the giraffe??? Oh my gosh, he did it! They’re just so cool looking! Look at their sweet faces! Holy cow – they’ve got a dang big ole head, now! I did get to pet his nose, but not for long. But they have personality, too…. 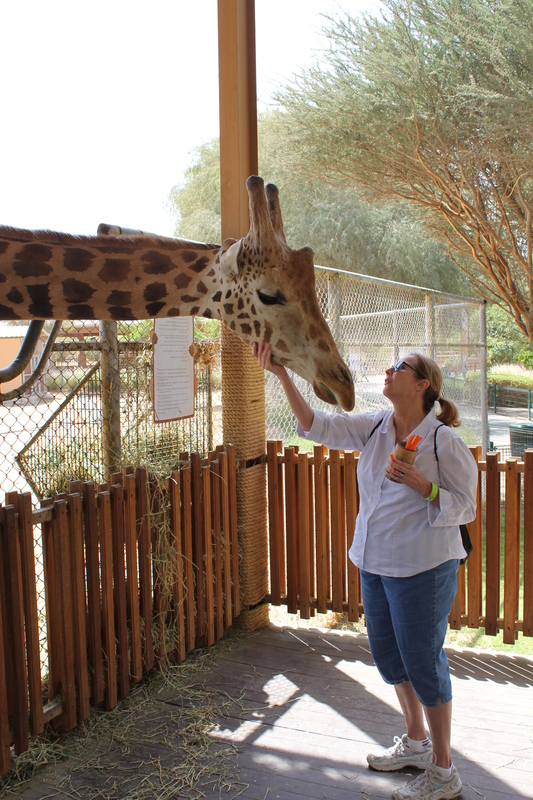 One was bold, knew exactly how far to lean towards you for photos and carrots. 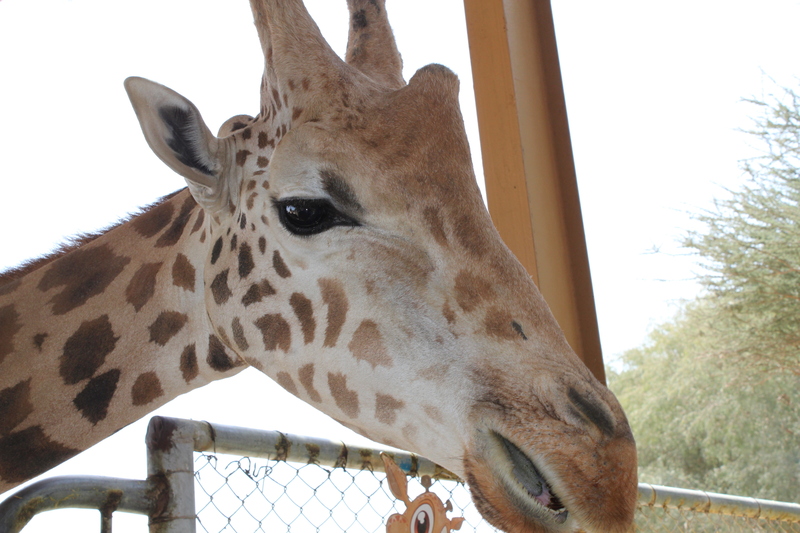 Another was timid, wanted to get his mouth close, but on *his* side of the fence, and just stick his giraffe-lips and tongue through the fence to get the goodies he smelled….. funny. He’s got that tongue all stuck out, huh? 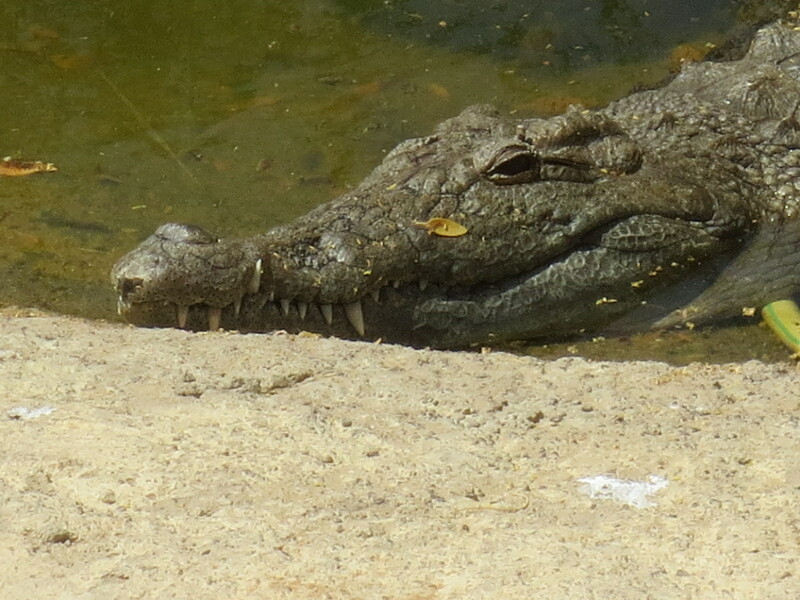 He’s wondering how close he’s gonna have to get….. 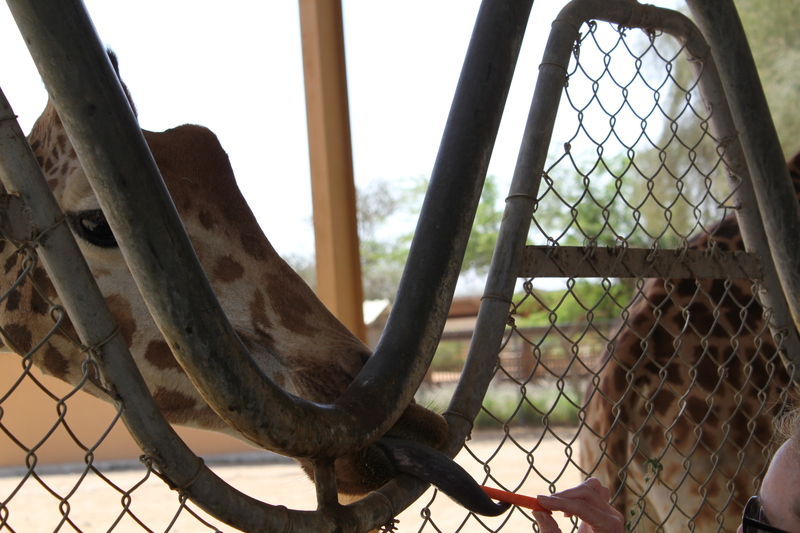 Speaking of giraffe tongues, did y’all know how incredibly flexible they are? I mean, here comes this big long slimy snail-looking thing out of his mouth, but it’s pointed, and searching gingerly for the carrot he smells…. 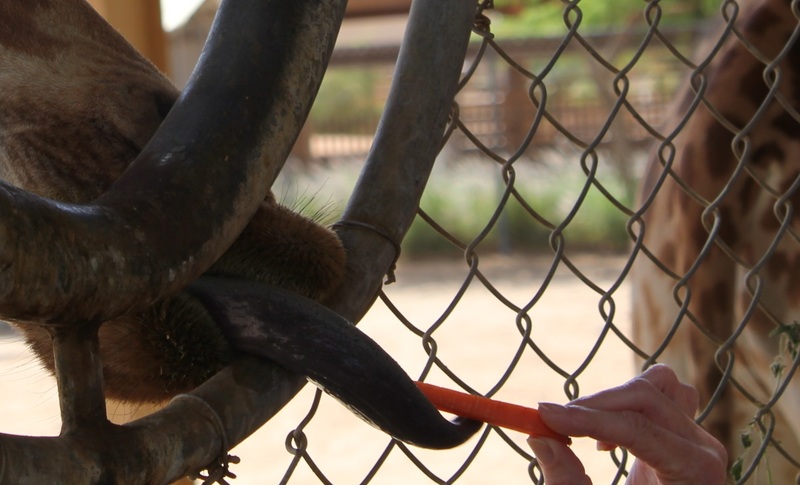 When the tip of his tongue touches it, he coils his tongue around the carrot in a spiral, like a snake or something…. I never imagined that! Then, he’ll gently take it from your hand and back away to munch it. Funny as heck. 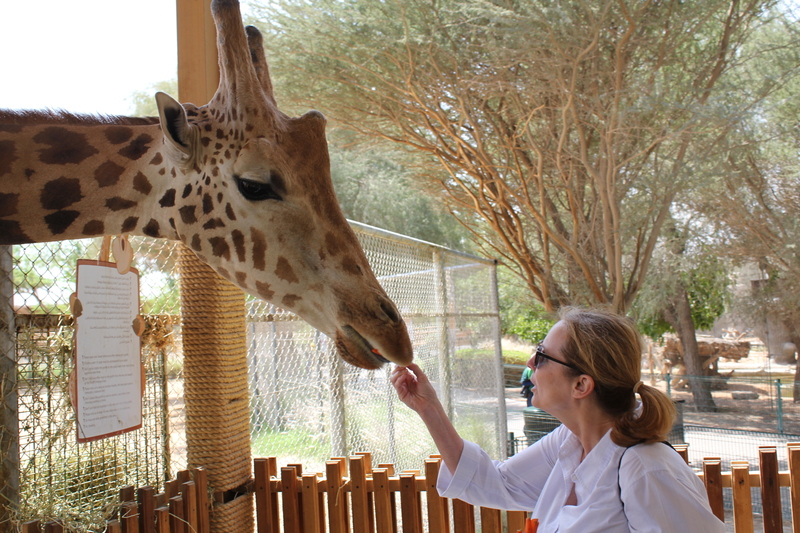 I got to scratch one’s neck and jaw for a minute, y’all, it was so cool! OK, but this is my laaaaassst one! There now…. doesn’t that feel good?? Oh my goodness! Who knew they could do this?? Too funny…. he wanted more! They have fur that’s almost exactly like a horse’s, or a cow’s….. straight, stiff and soft feeling if you pet it in the direction of growth. If not, it’s bristly. Pretty cool. 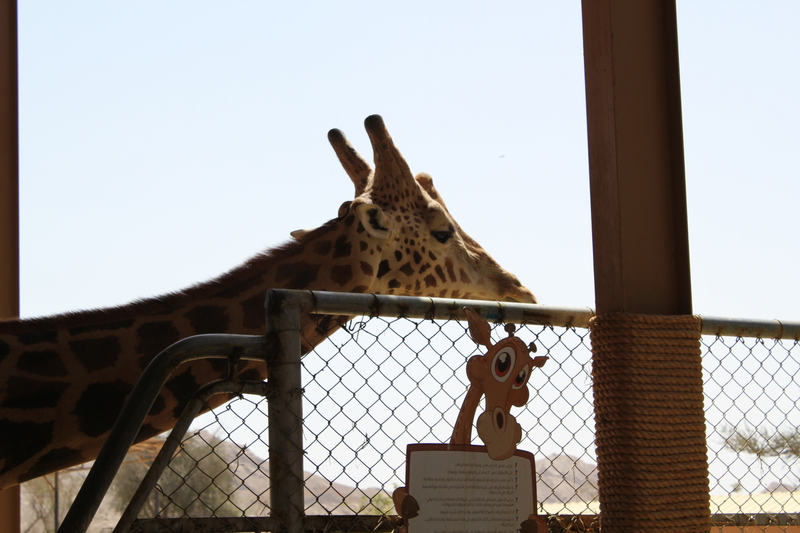 Oh, and the giraffe toes are just like the camel’s…. only two, poor things. 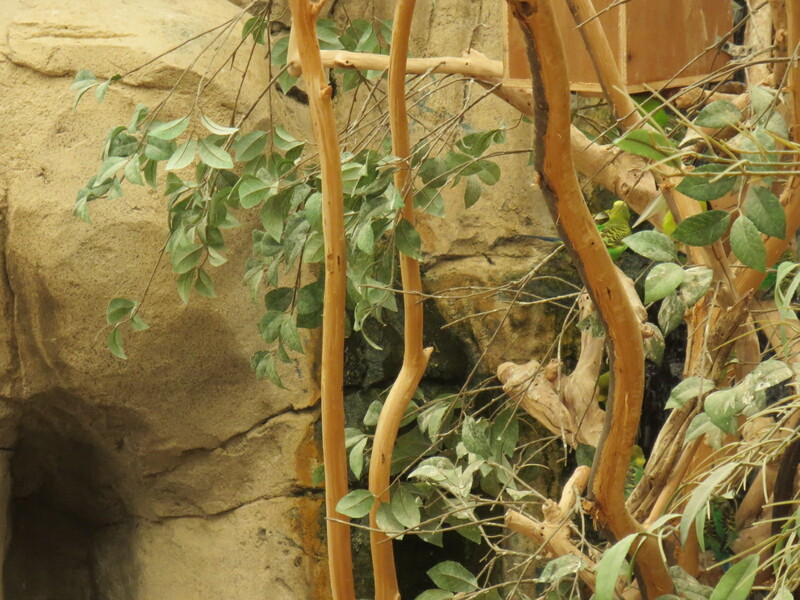 Yes there were other animals there, a reptile house…..
Outside of the reptile house. 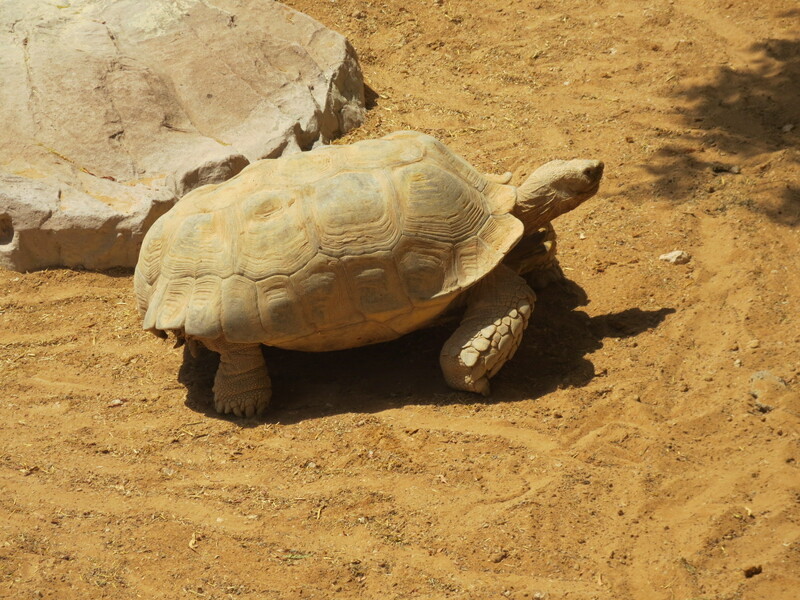 A giant tortise…. 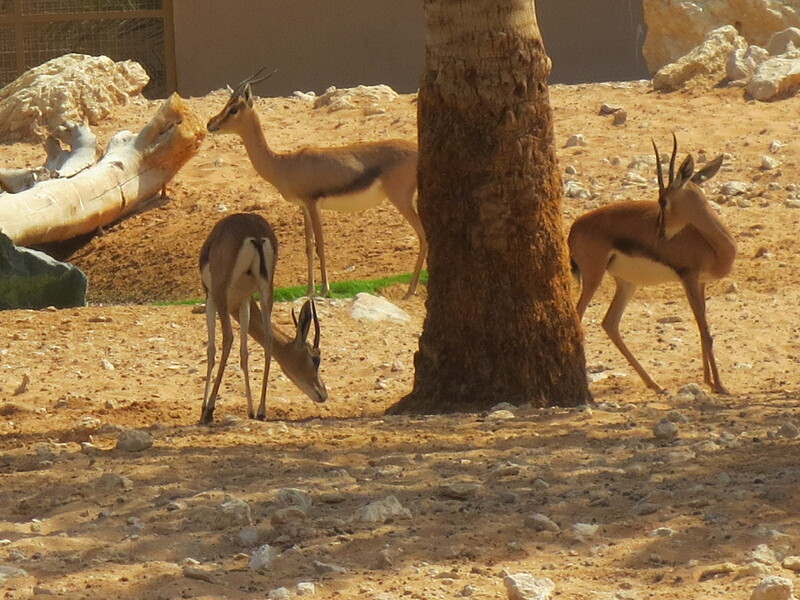 we got to see them at lunchtime too, and I was surprised at how quickly they can move when there’s food involved! 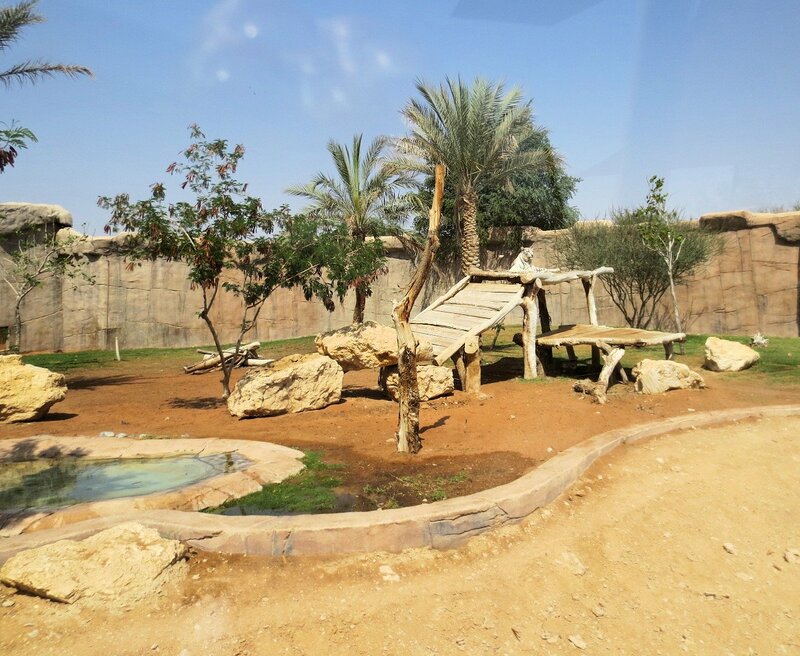 There was an area with the big cats too – white tigers were totally amazing. I watched them for a long time. 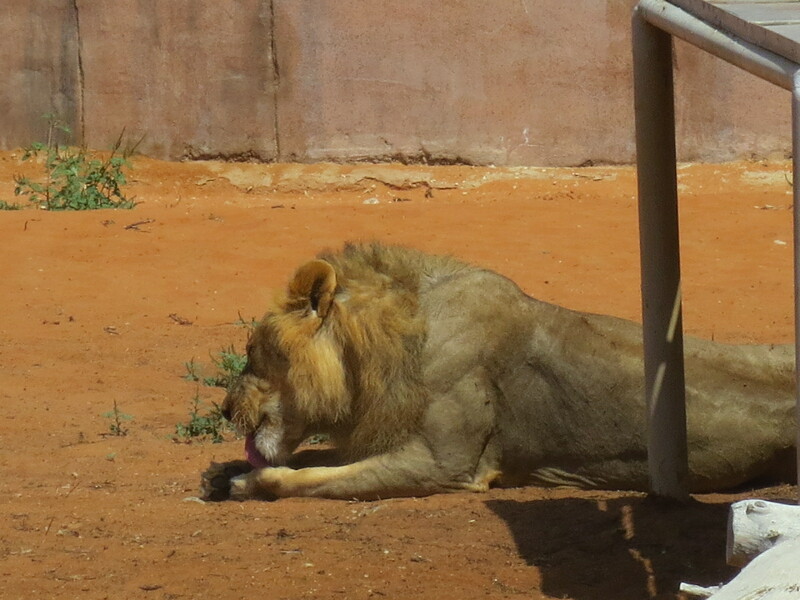 This lion guy was licking his paw – I thought it was such and oddly endearing thing for him to be doing. Well, at least he wasn’t sleeping! 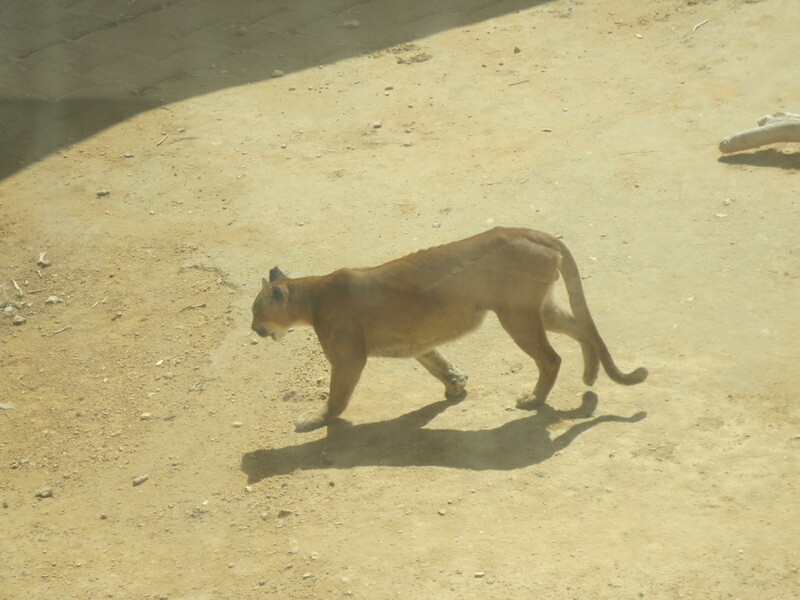 This is a pacing puma. Honest. All he did was pace. Made me wonder if he was unhappy?? 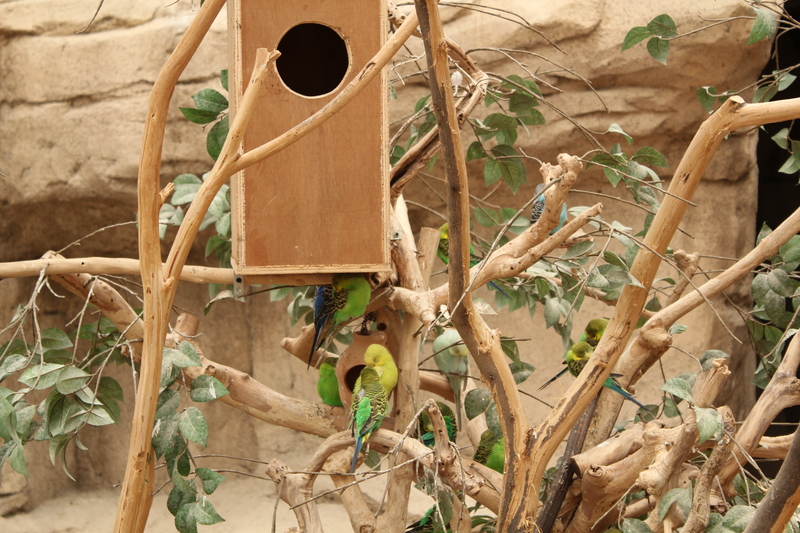 And a pretty cool aviary. 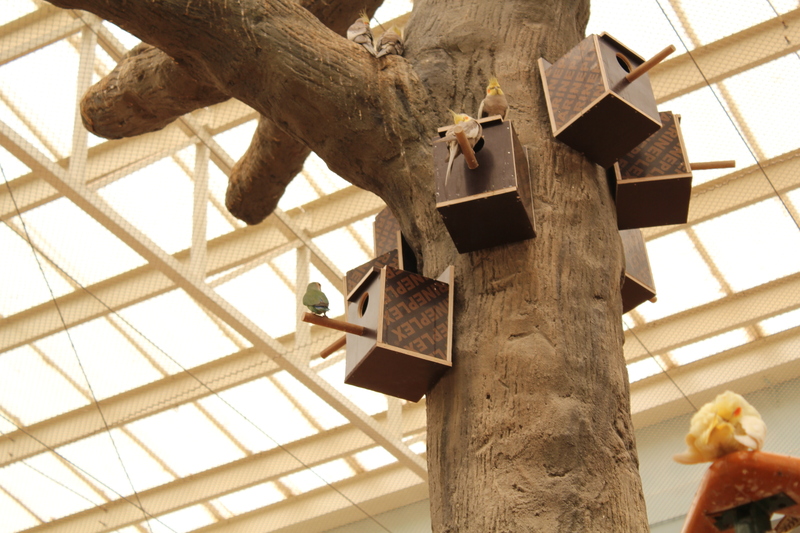 That’s the bird house, right? 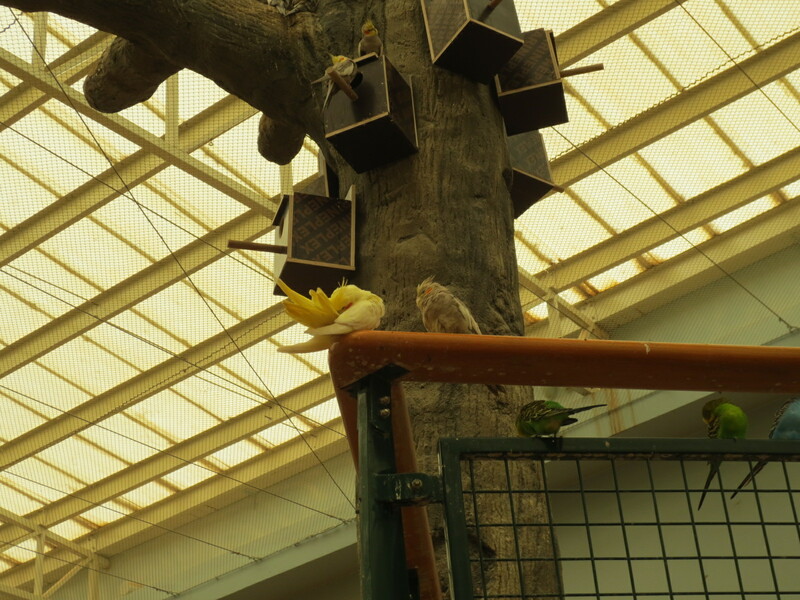 😉 There were parakeets, parrots, and tons of tiny little finch-like birds…. too cute. 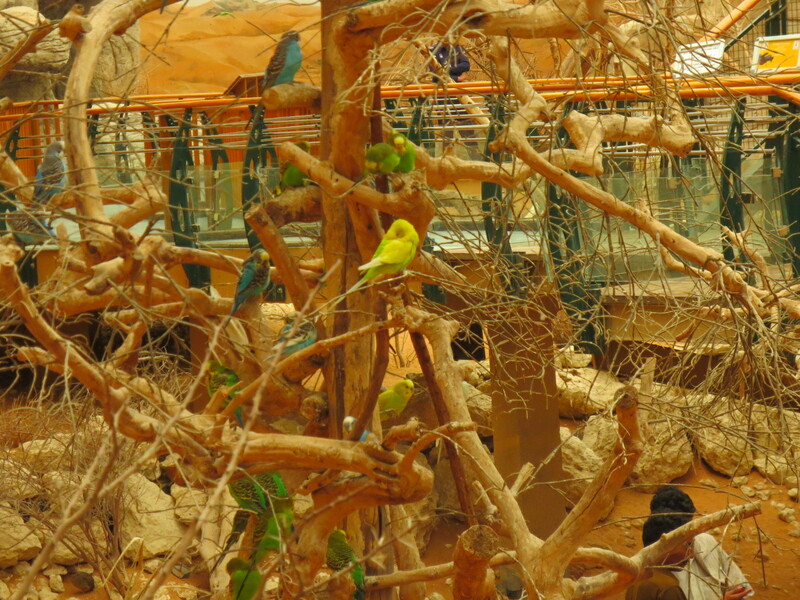 The parrots were paired up, and we’ve seen a number of them flying around in our neighborhood here. 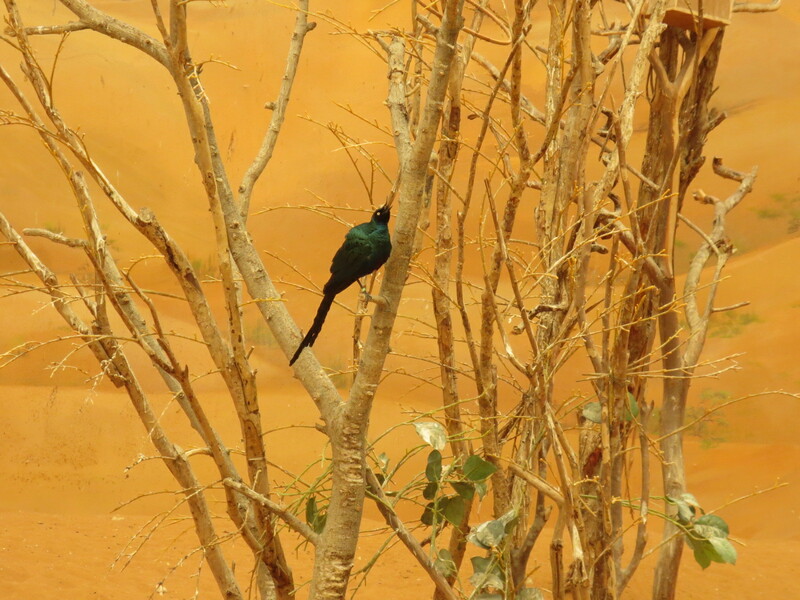 The other day, two of them about maybe…. 16 – 18″ long landed on the upstairs balcony handrail and sat there and screeched and scrawked for a bit, not minding at all that I was there watching them and talking to them! 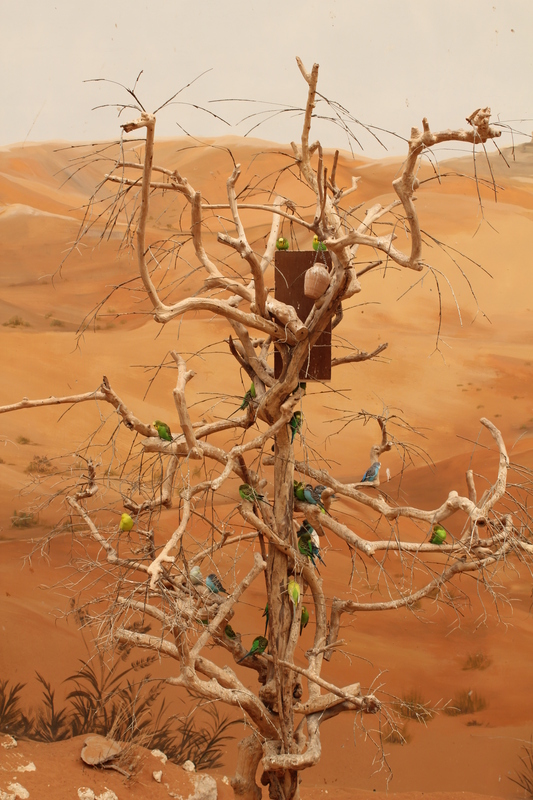 Bird neighborhood. Wonder if they like having their houses so close together? Hey now, you’re hidden in there pretty well, aren’t you? 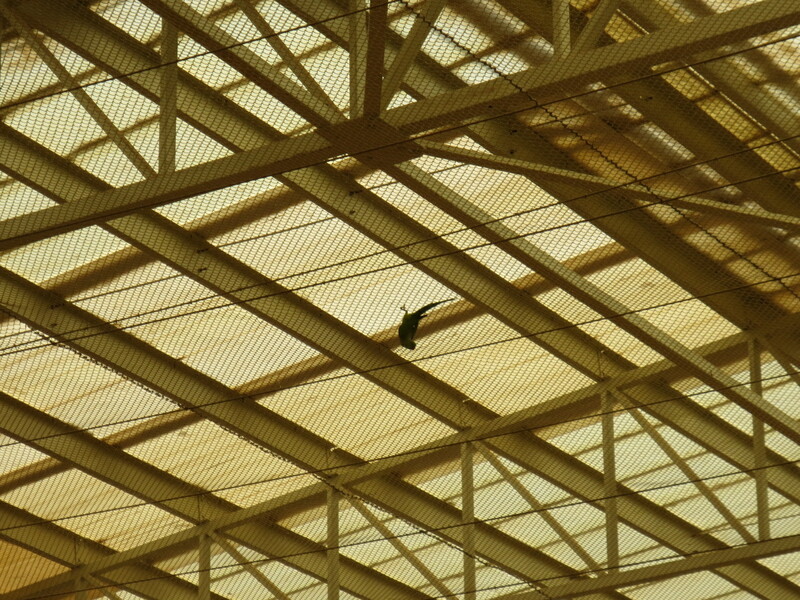 The parrot’s other friend… hanging upside down from the screen covering the roof of the aviary. 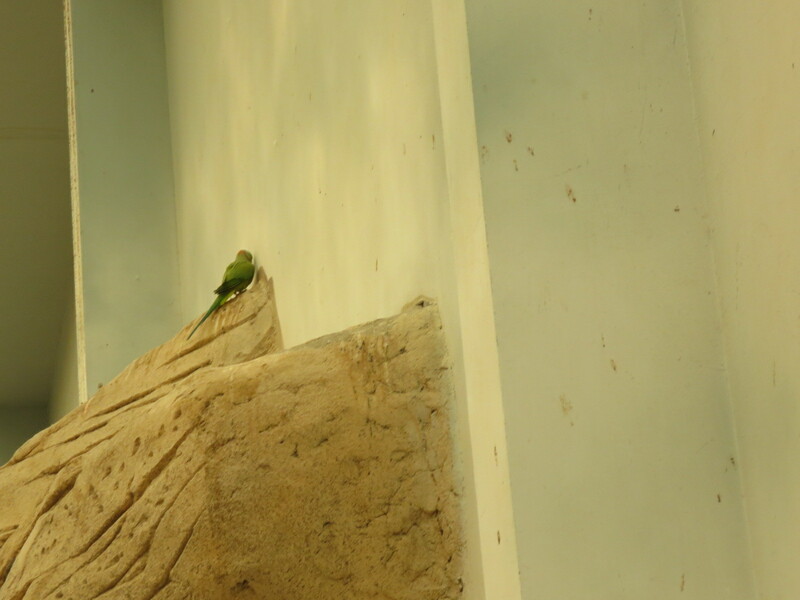 Finally managed to snap a photo of one of the parrots – they’re such a vivid green. 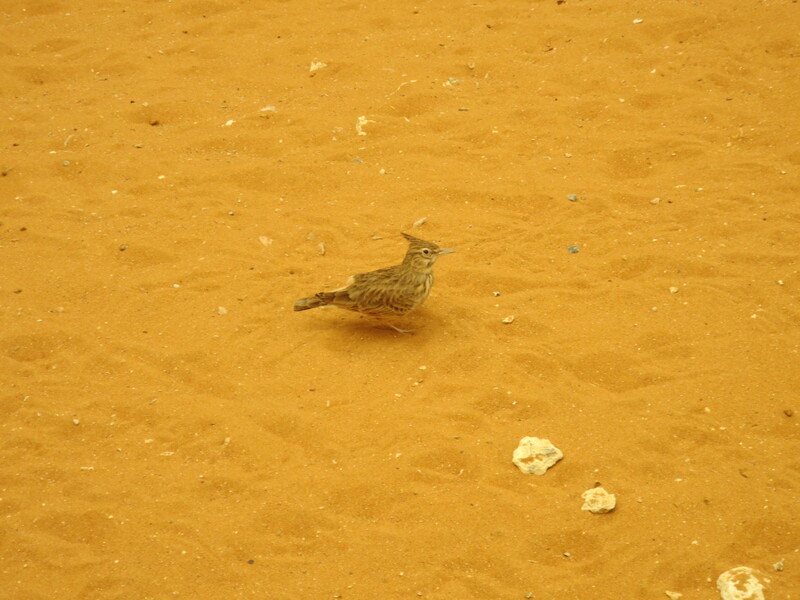 Looks kinda like one of the US southwest’s roadrunners, doesn’t it? 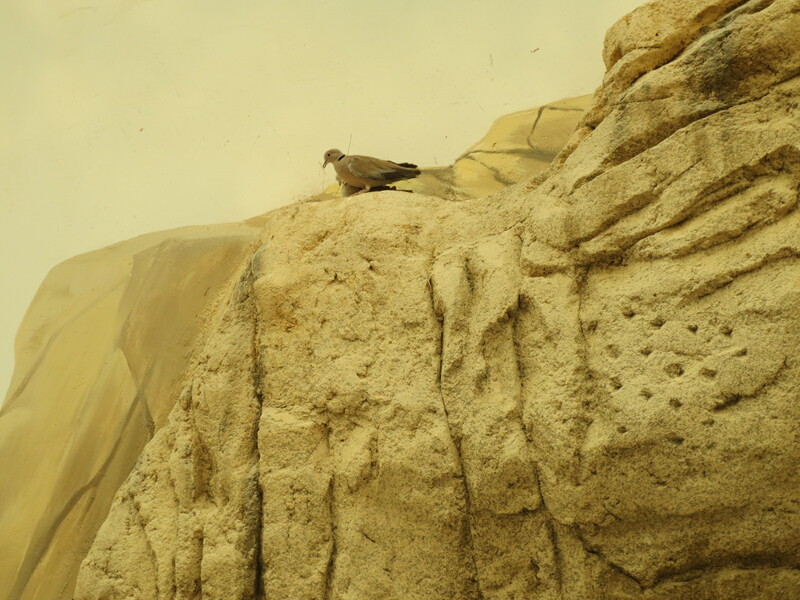 These two doves were building a nest. 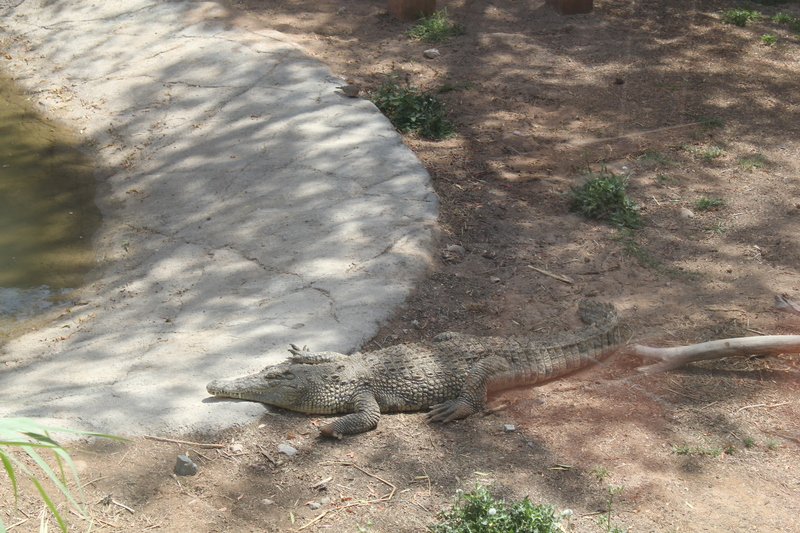 I forget what these are called, but there’s a pair of them that comes to our back sliding glass door. They’re REALLY loud, and will peck at their reflected image in the door. I have video somewhere I have to dig out. 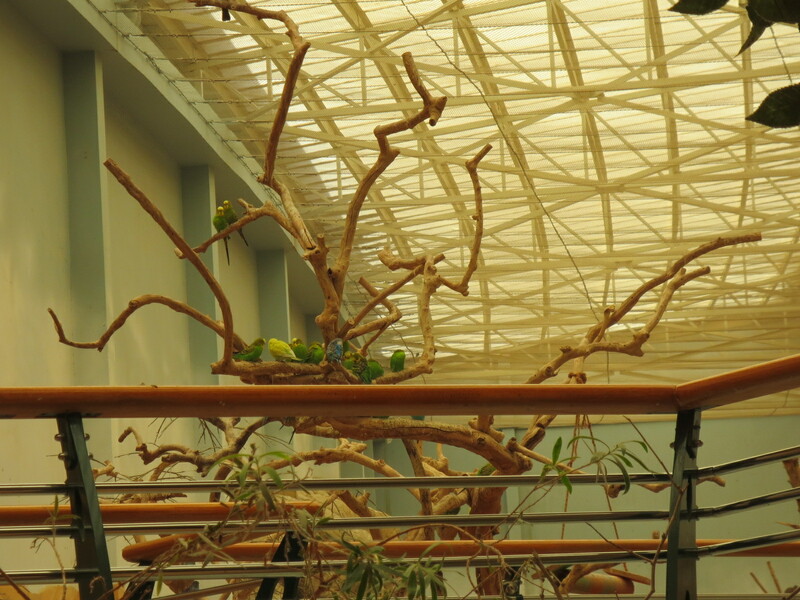 This is where the big green parrot *was*….. dang, they’re fast. 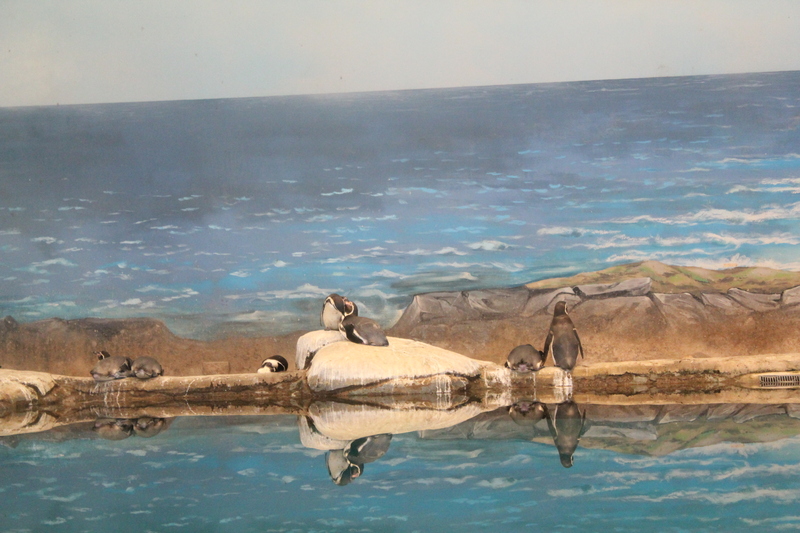 Penguins. 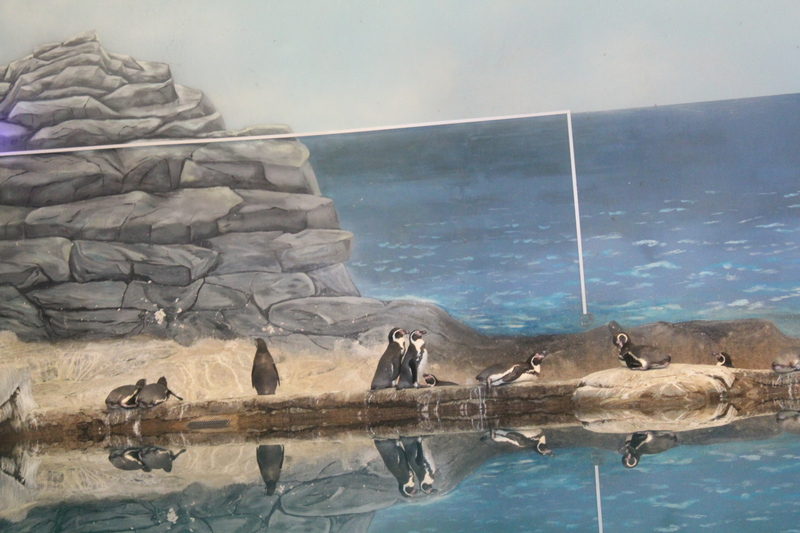 Sort of an obligatory display….. they were so far away, you couldn’t touch them, and we’ve got Peng-friends already…..lol. 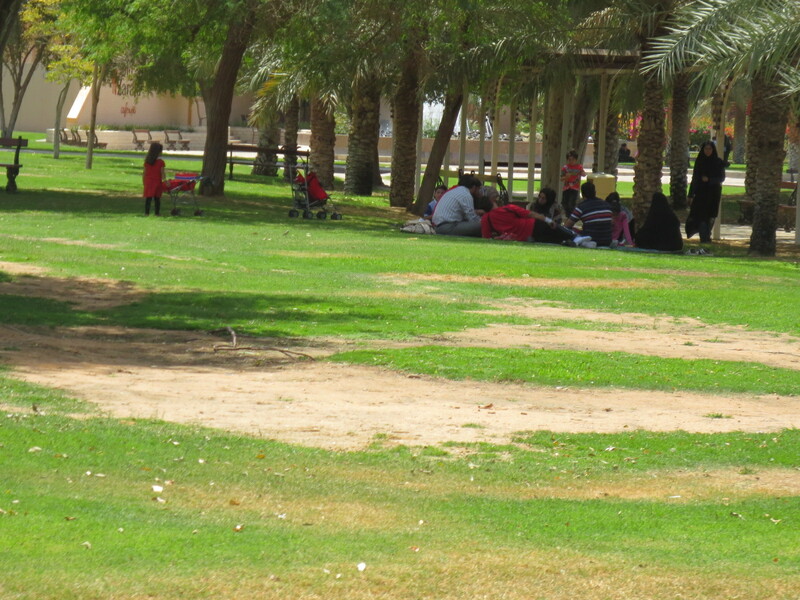 This place is really popular with families… you can see people sprawled out all over the grassy lawn areas in the shade…. most brought picnics…. I’m so glad we went there – it was a really good day. OMG! 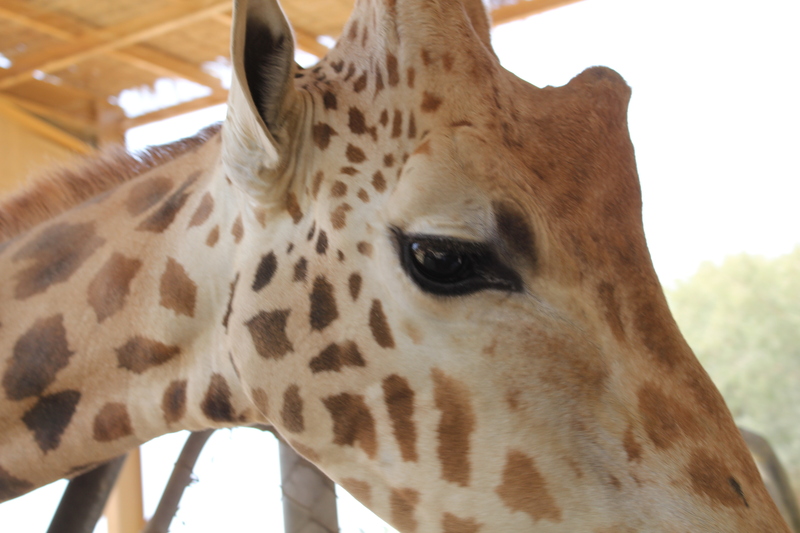 A giraffe! I’m so jealous. What a fabulous experience. 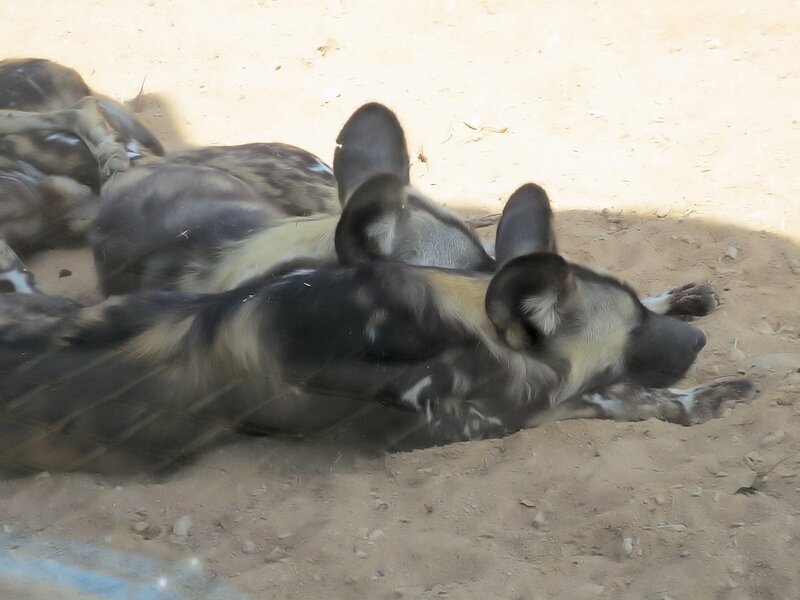 Those dogs look like African Painted Dogs. 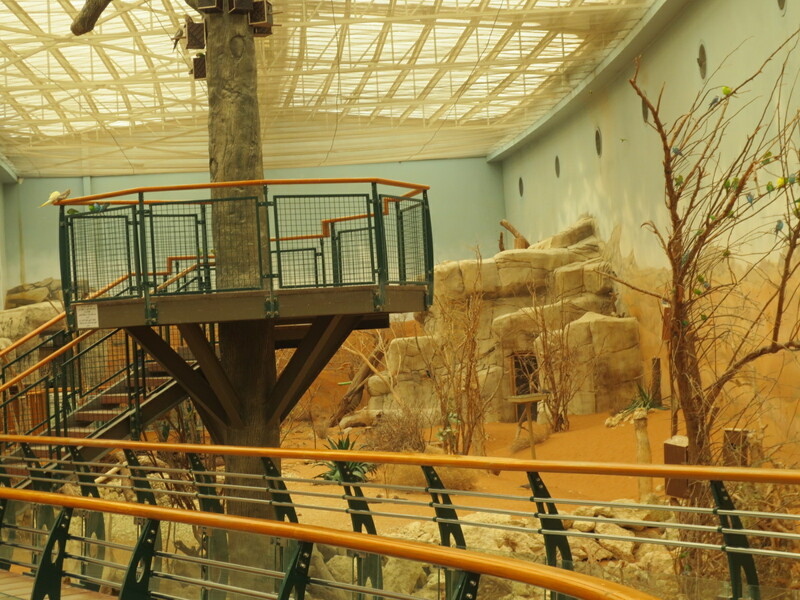 Did you hear about the tragedy with the little boy at the Pittsburgh zoo a while back? 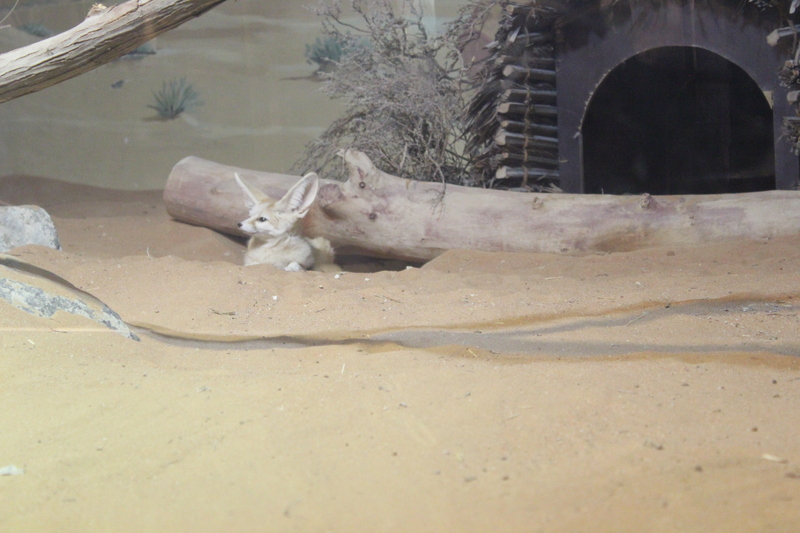 That was always my favorite exhibit. 😦 Anyway that pic reminded me of them. 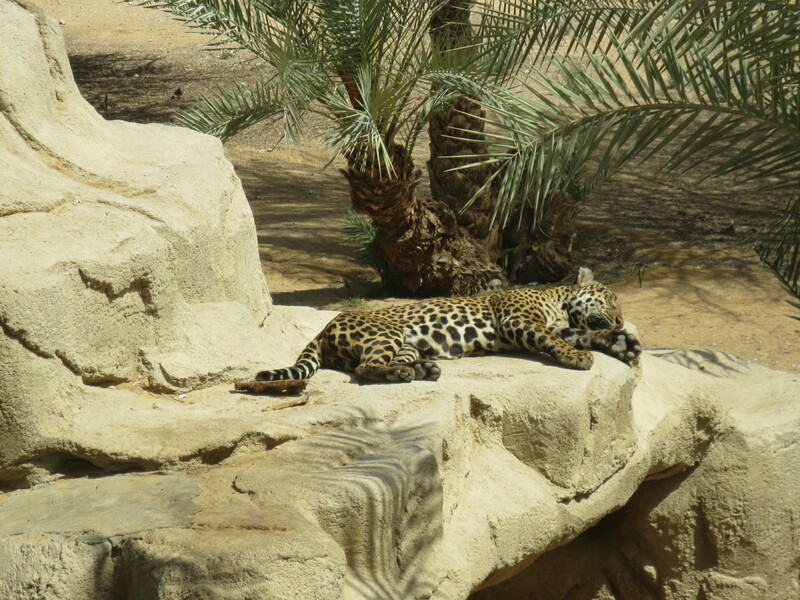 Such beautiful animals. 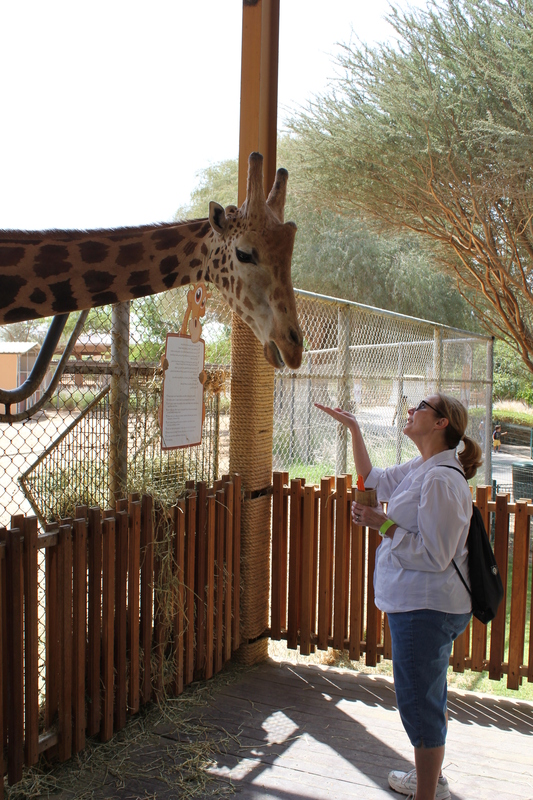 Marcia, I hadn’t heard about the zoo incident – holy cow, how sad is that? Wow. They do look like the same creature, though. 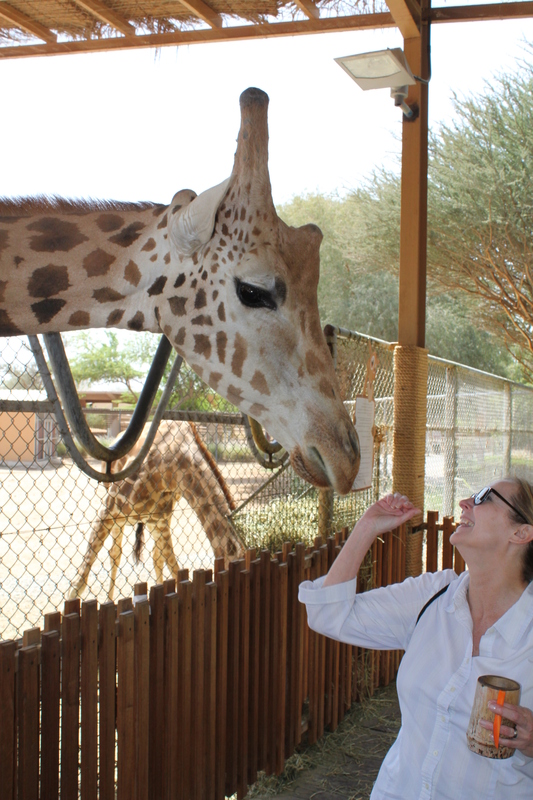 And yes, the giraffes were fabulous, I am still in awe that I got to do this! 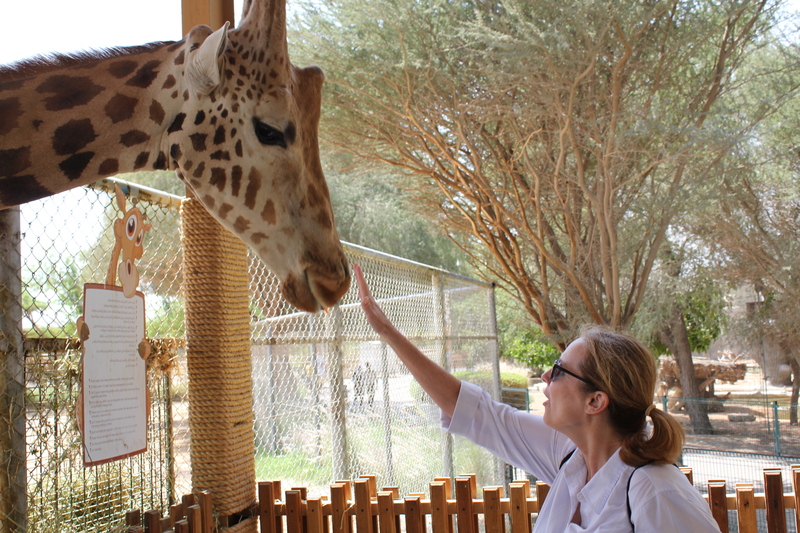 So jealous that you’ve got to pet penguins, ride a camel and now fed and skritched a giraffe! I’m gonna have to get myself out of Bama one of these days and have an adventure too! At least I still have Kellie and her fainting goats to play with! LOL! Glad that you’re making the most of your time there! *sigh*.. you just HAD to get the freekin goats in there, didn’t you? Have mercy. 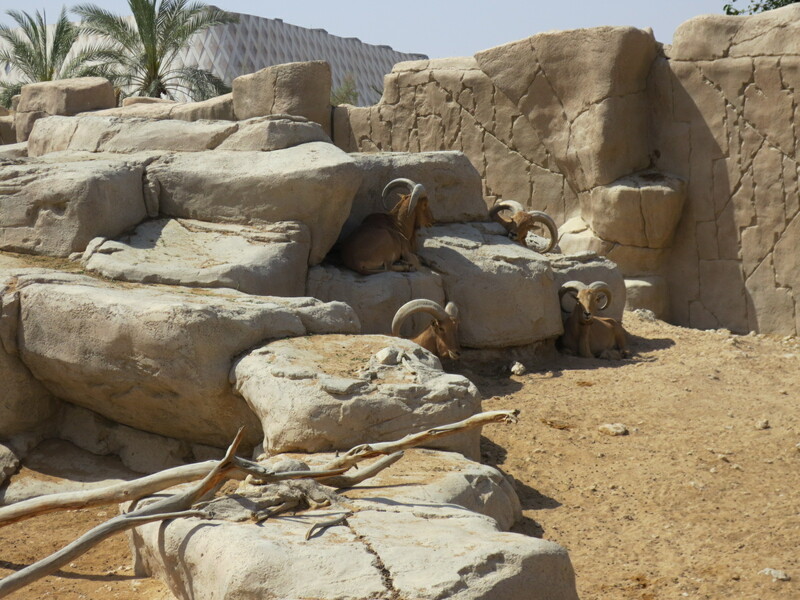 Remind me to tell you sometime about TBG’s freaking out his students a looooong time ago with fainting goats and helicopters….. We really are making the most of this place. He’s constantly asking me “so… what’s next? ?” I have a list!